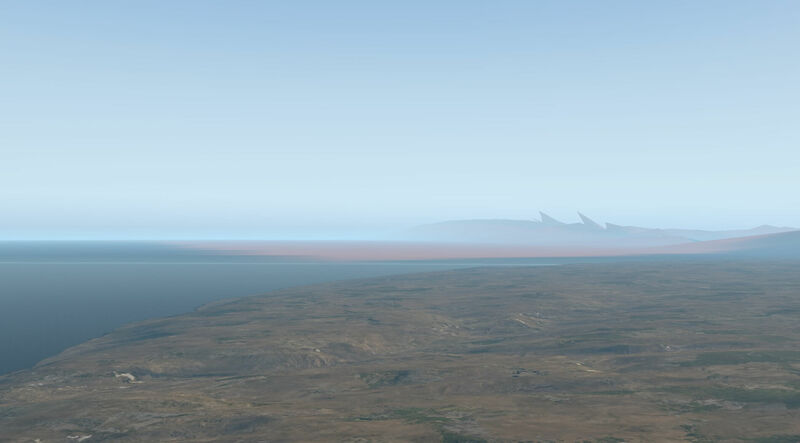 Information provided on the X-Plane store states that this scenery aims to create over one million square miles of scenery above the 73rd parallel in Canada and Greenland. The area covered is approximately 188 x 835 miles (2900x1350 KM) and this includes all mesh terrain for Greenland and Canada above 73rd parallel. 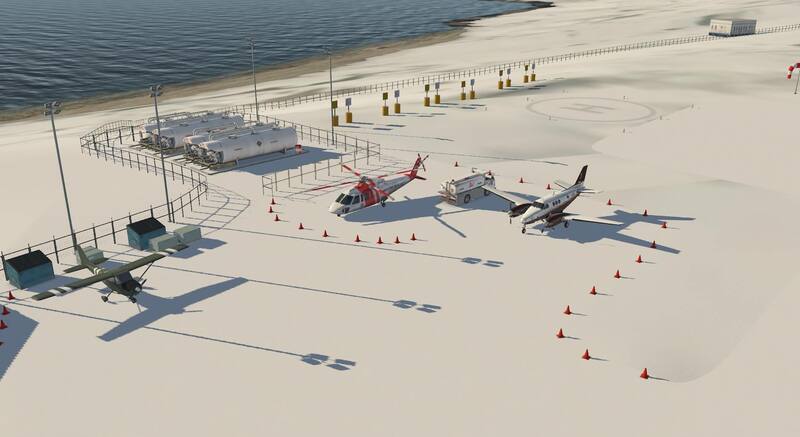 23 airfields and heliports are included. There is advice supplied by the developer that this is a large download and needs a stable internet connection. An installation guide is also included in a separate download. The installation guide also provides links to download the main scenery folder. The downloaded folder should be unzipped and will be found to contain three sub folders. 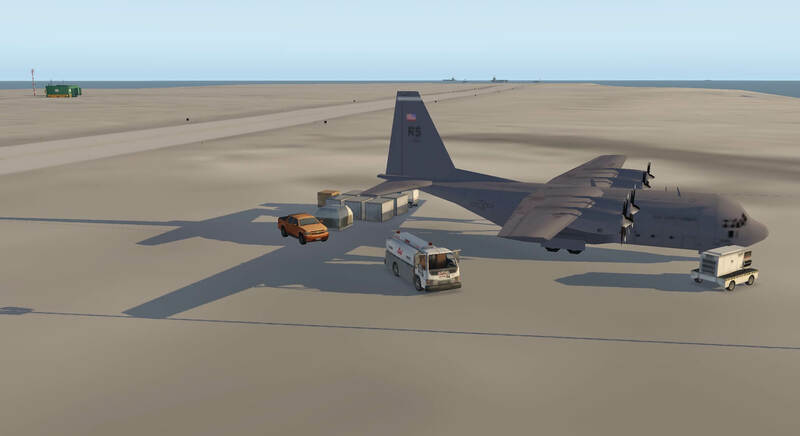 The contents of each should be copied and pasted to the corresponding folder within X-Plane. 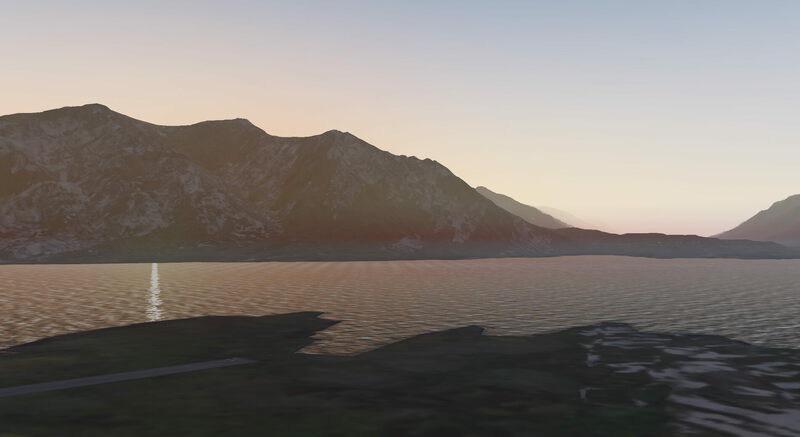 Launching X-Plane then loads the scenery for use. Given the extent of the scenery I thought this may be a more complicated process but it is straight forward and works very well. 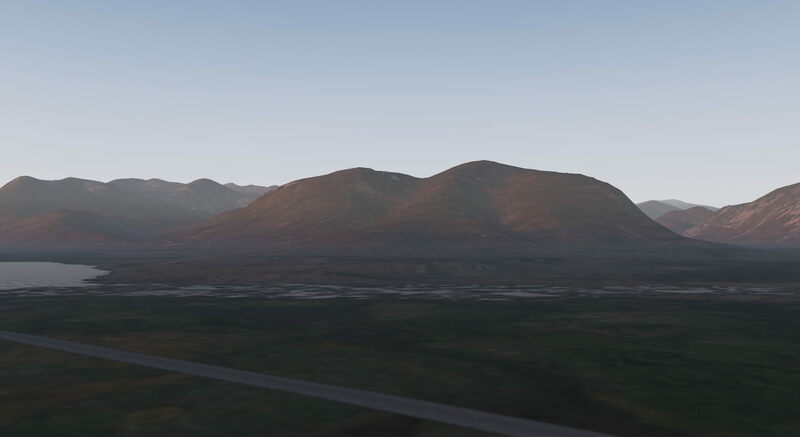 The installation guide does give advice on adding this scenery to X-Plane but also states that the scenery has been developed for realism in flight and therefore will not include tiny details in the landscape or the airfields themselves only those details to add value to flights in the area covered. 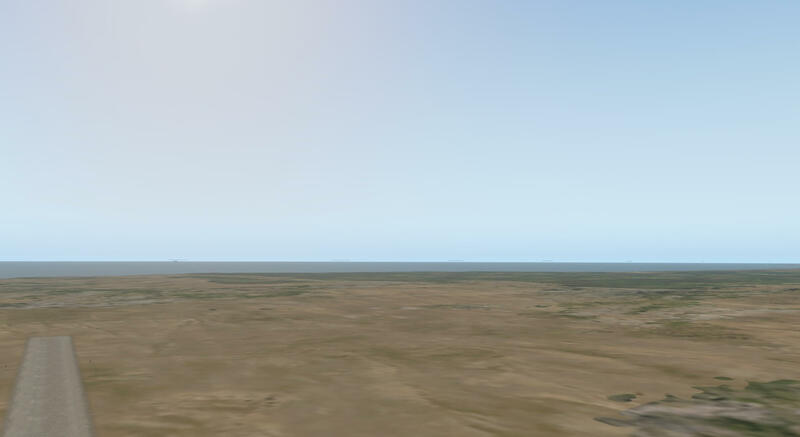 Once loaded X-Plane recognises the airfields in the location box in the flight configuration page and they all appear in the M key X-Plane map inset with navigational aid information. They can be loaded by name or the code provided for that location with the scenery. 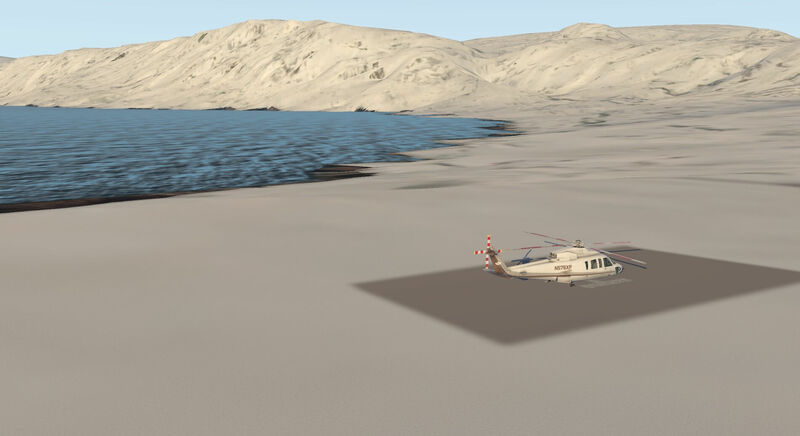 I found that the download did not include North Grip Ice Landing Strip in the custom scenery folder and this base did not function in the locations options box. I completed a second full download to check the first and that the scenery for North Grip was missing from this also. This scenery covers a large area and I considered how best to review such a large amount of detail, accepting I could not visit every part of the landscape. I decided that a tour of the modelled airfields would be a good way to consider the highlighted venues and the scenery around them. The venues are distributed across the scenery giving an opportunity to assess different areas. I used information from Wikipedia to describe and give background for each location as I visited to explain the nature of the facility and why it was constructed, to put in to context what the developers were trying to recreate. Not all the ICAO codes were recognised either by X-Plane FPS or by Goodway. 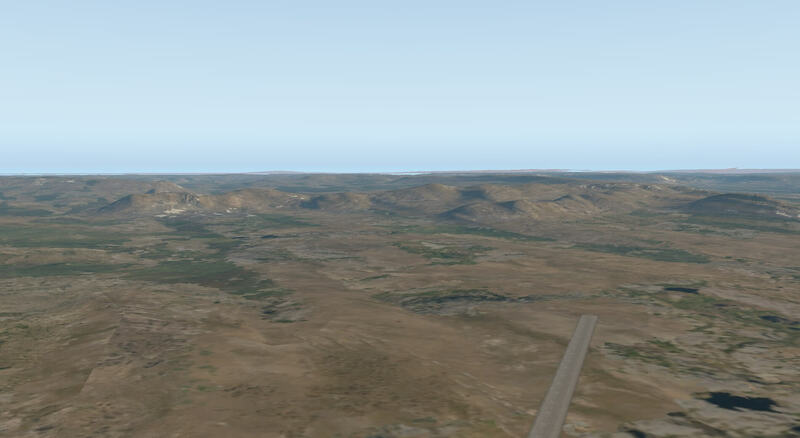 I also referred to Little Navmap which is described as a free open source flight planner, navigation tool, moving map, airport search and airport information system which supports Windows 7/8/10, macOS (10.10 or newer) and Linux (64bit only). 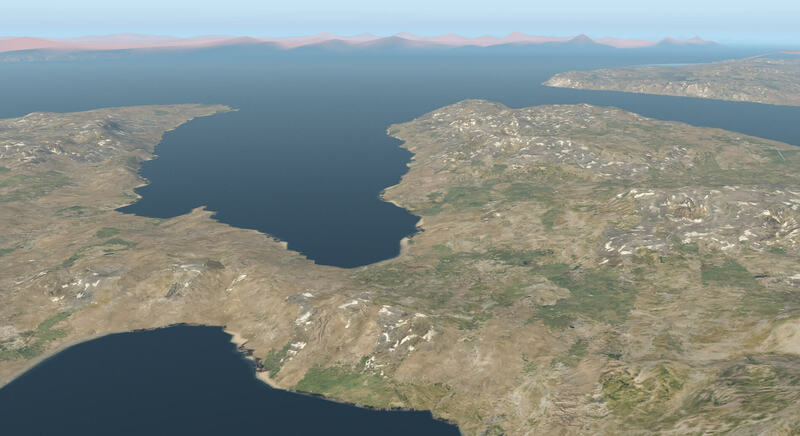 This can be used as a plug-in with X-Plane and gives useful information on the airfields it covers across the world as well as producing flight plans that can be exported to X-Plane. I have commented on this during each airfield description and produced a list, reproduced later in the review, giving the codes and status of the airfield and also whether I found them to be recognised by flight planners. I took a route starting from Pond Inlet and then moved from one venue to the next in what appeared to be a logical route. 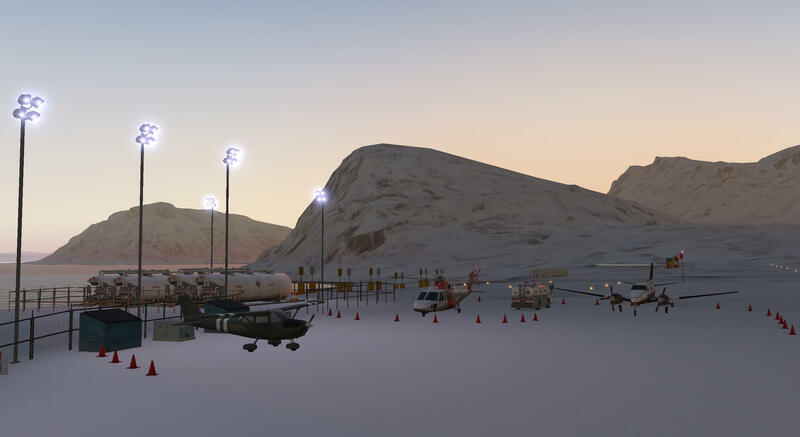 I started my journey at Pond Inlet Airport, ICAO CYIO recognised by X-Plane FMS and the two flight planners, which is located at Pond Inlet, Nanavut, Canada at the top of Baffin Island. 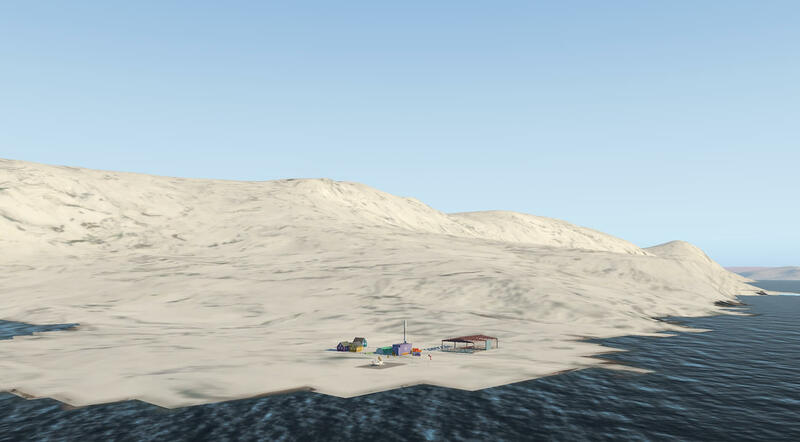 The Polar Pilots website explains that the area has been inhabited by Inuit and their predecessors for thousands of years. The English name Pond Inlet comes from James Pond, the British Royal Astronomer in 1818. Explorer John Ross named the area about 5 km east of the present community in honour of Pond. Traders, whalers and explorers frequented Pond Inlet for more than 200 years. The Hudson’s Bay Company and other traders had established posts there. The Hamlet of Pond Inlet was incorporated in 1975, at the time Inuit were moving into permanent communities. At the eastern entrance to the Northwest Passage, Pond Inlet plays an important role in the history of the Baffin region. 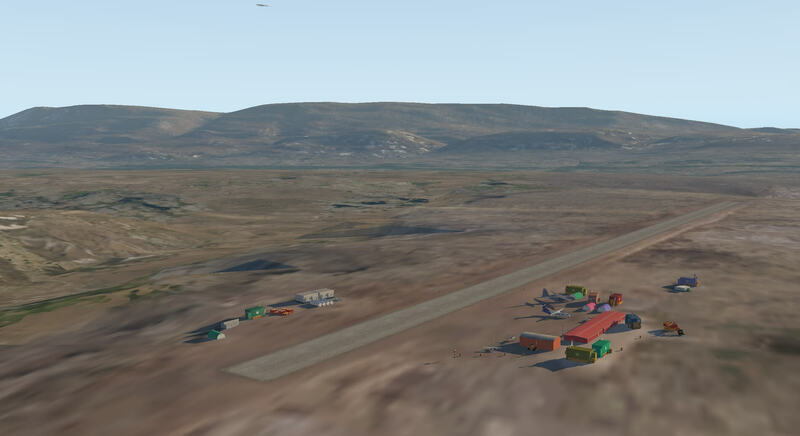 The airport is operated by the government of Nanavut. 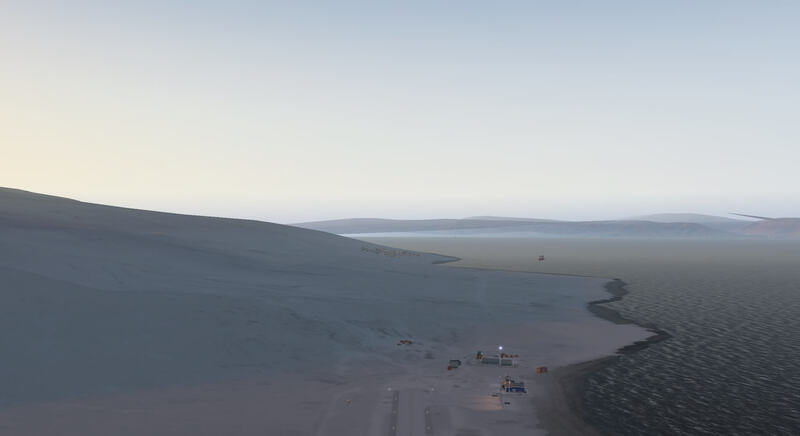 Its gravel runway 02/200 has a length of 4006ft (1221M) with an elevation of 202ft (62M) AMSL. The airport is used by two main airlines Canadian North and First Air. At Pond Inlet the arctic ice and snow were not yet truly evident though there were a few white patches. The gravel run way was clearly modelled with runway lights alongside, visible during the day as the light was reducing. The surrounding area is modelled to have a rough grass appearance with numbers of low growing trees as expected in this part of the world. A single road leads to the end of the runway but no other buildings or infrastructure are modelled. The airport has an AWOS with a frequency of 128.3 MHz and an NDB (YIO) with a frequency of 214.00MHz. 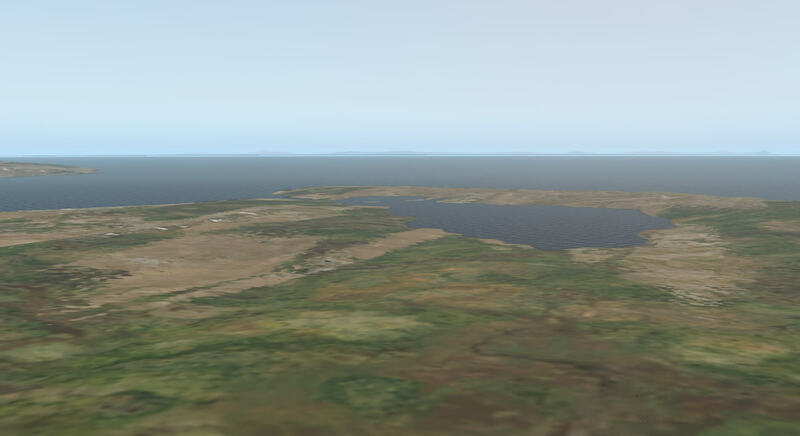 Whilst there are few notable objects to use for VFR the proximity to the coast makes this feasible. 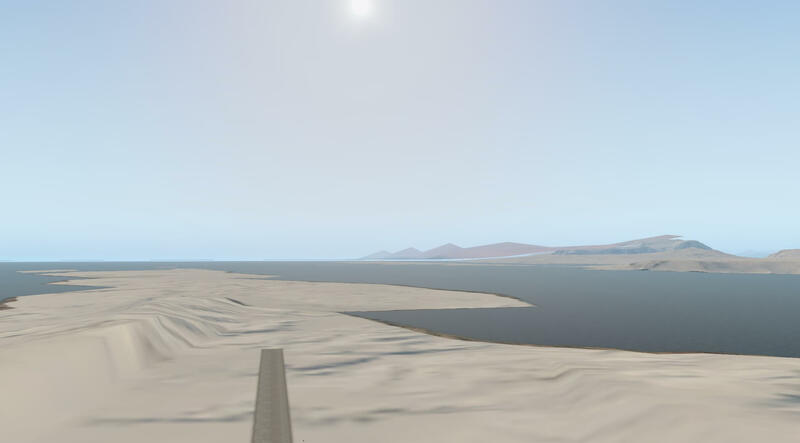 In good visibility the user can gain a real sense of the remoteness of the airfield with views of mountains and sea in all directions. 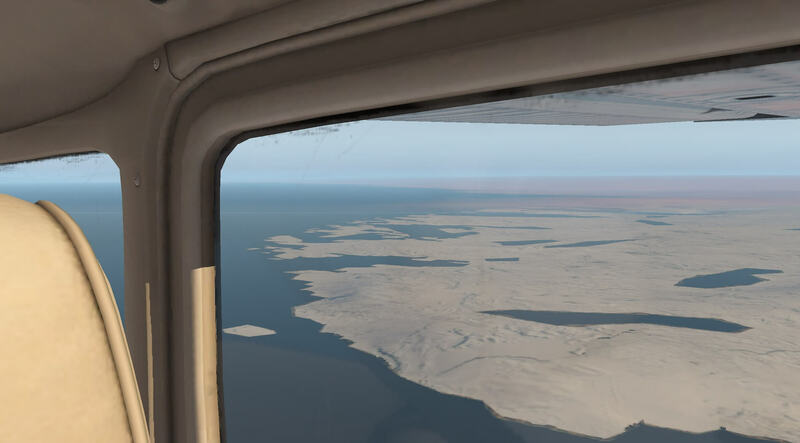 The next stop on my tour was Arctic Bay, recognised in X-Plane FMS and Goodway as ICAO CYAB and in Little Navmap as CJX7. 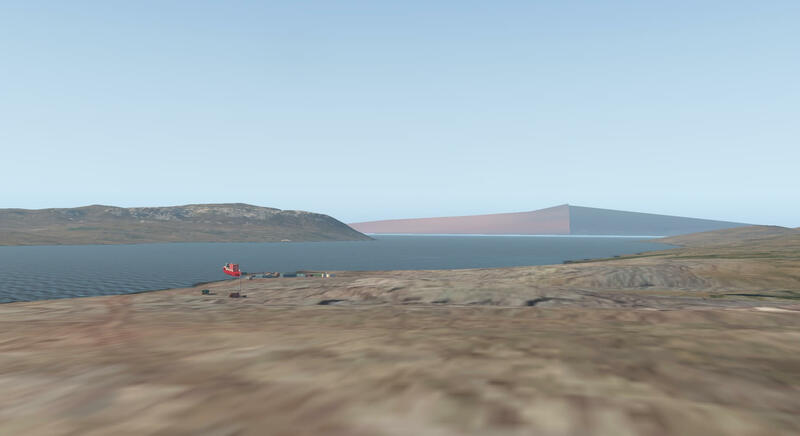 The airport is located 3 nautical miles (5.6 km; 3.5 mi) southeast of Arctic Bay, Nunavut, Canada. 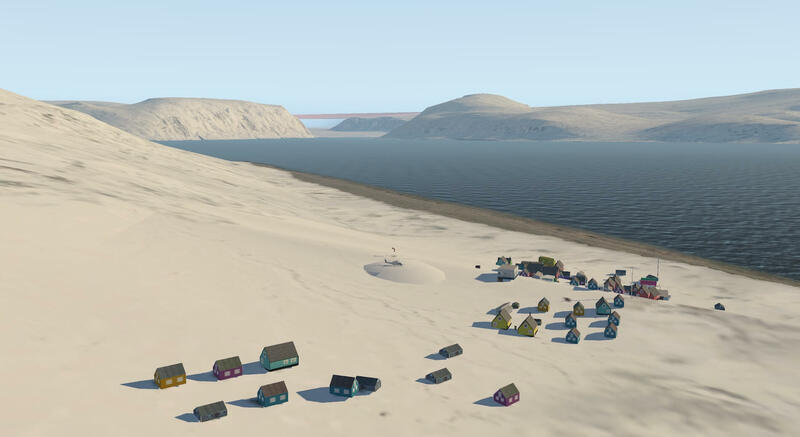 Arctic Bay is an Inuit hamlet located in the northern part of the Borden Peninsula on Baffin Island in the Qikiqtaaluk Region of Nunavut, Canada. The predominant languages are Inuktitut and English. At the 2016 census the population was 868. 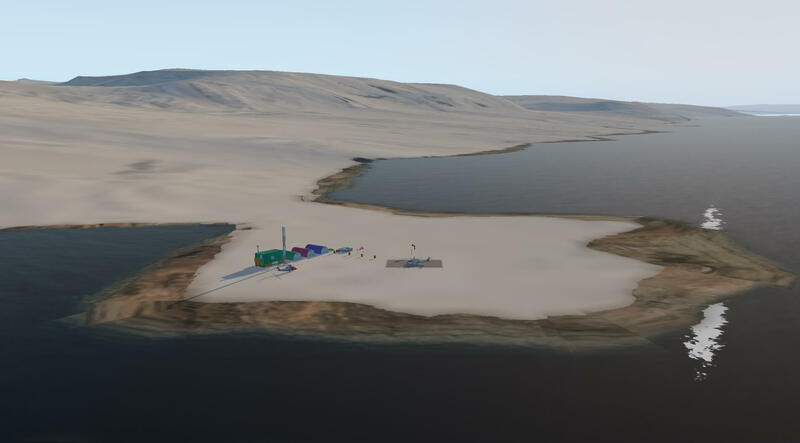 Until January 12, 2010 Nanisivik Airport, about 25 km (16 mi) from Arctic Bay, was used for scheduled flights. 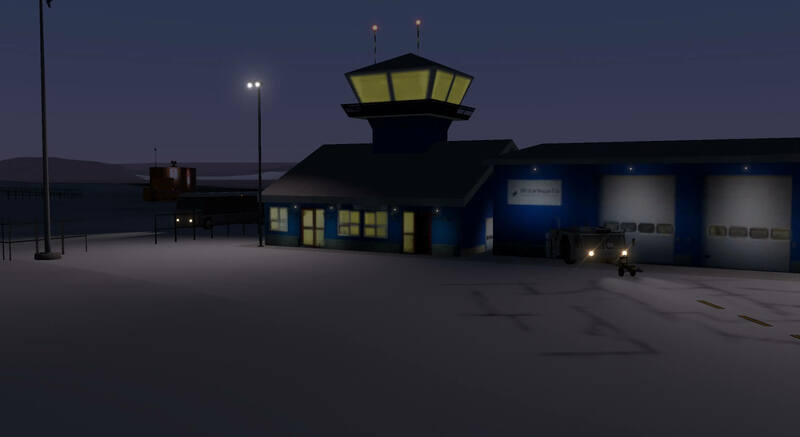 On January 13, 2010, the airline First Air transferred all air services to Arctic Bay’s newly expanded airport with service to Iqaluit and Resolute Bay. The Arctic Bay area has been occupied for nearly 5000 years by Inuit migrating from the west. In 1872, a European whaling ship, the Arctic, captained by Willie Adams, passed through and gave the area its English name. The Inuktitut name for Arctic Bay is Ikpiarjuk which means “the pocket” in English. This name describes the high hills that surround the almost landlocked bay. To the southeast, the flat-topped King George V Mountain dominates the landscape of the hamlet. 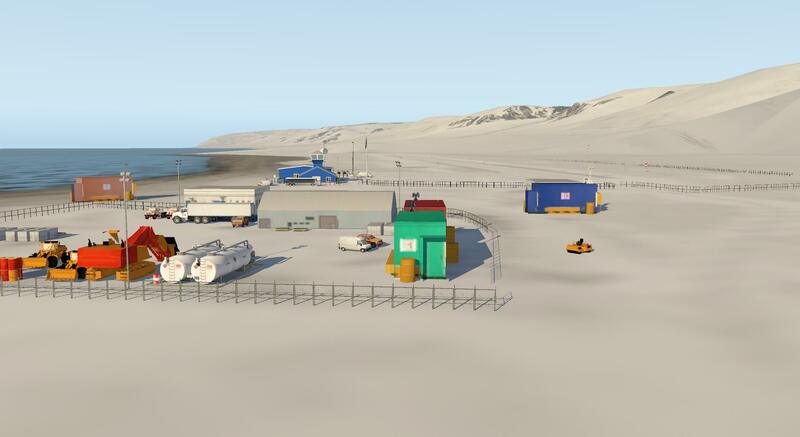 The community is served by annual supply sealift, and by Arctic Bay Airport. 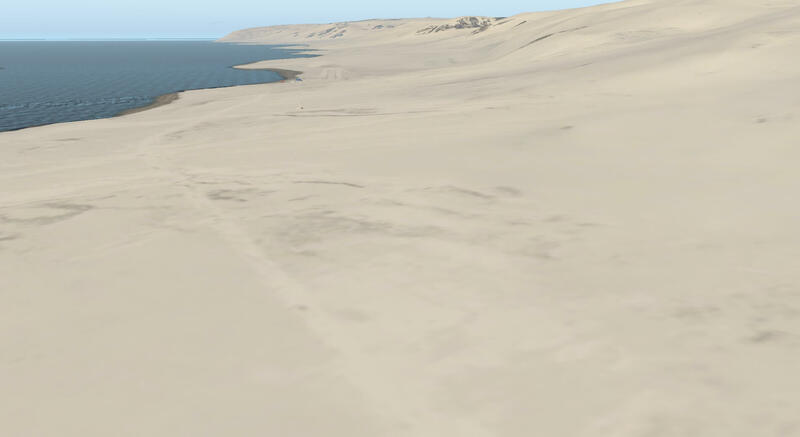 This is another gravel/dirt runway in a remote location. With good clear visibility the scenery again is of good quality with mountains, which create the ‘pocket’ and water in all directions. Again the countryside is rough grass with fewer trees than at Pond Inlet. 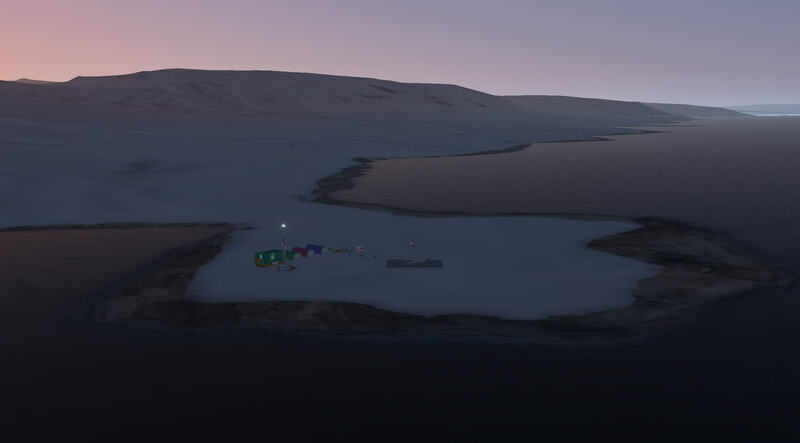 Whilst Pond Inlet had lights to either side of the runway the lights here are central to the gravel strip. No buildings are modelled but the roads infrastructure is visible. Again whilst there are no notable objects for VFR but the proximity to the coast and the position of islands and inlets may facilitate this. 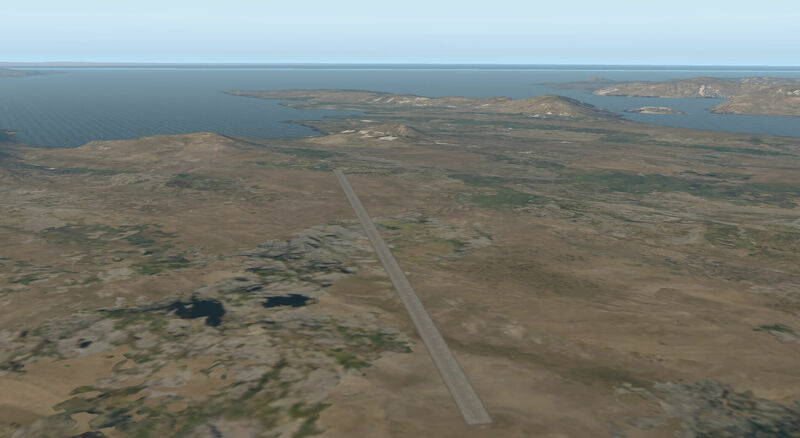 Runways 12 and 30 were extended in 2010 from 1507 ft (460M) to 3935ft (1199M) in length with an elevation of 72ft (22M) AMSL. 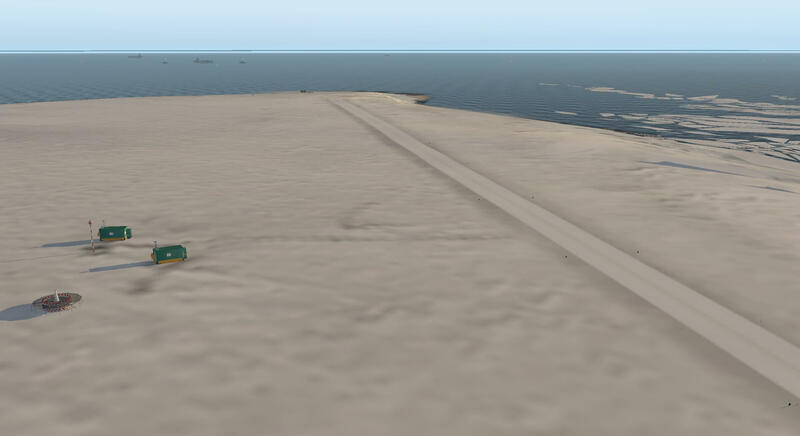 The airport has no COM frequency, helipad or navaids though waypoint NANSA is on the airfield. Colour and texture of the scenery is good and light and shadow react with objects as expected. 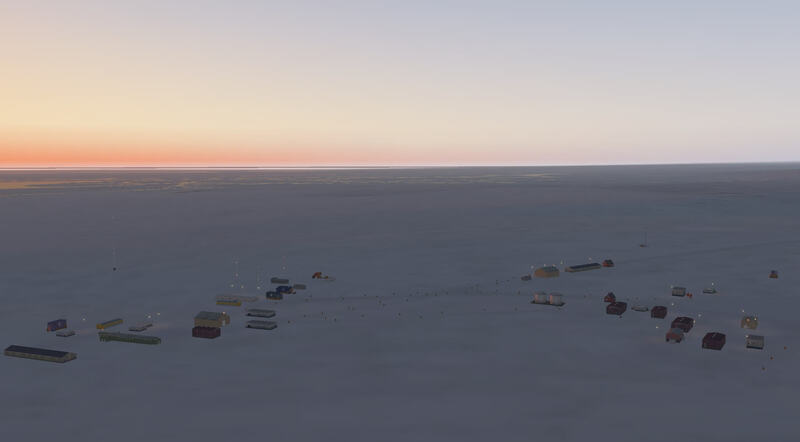 Moving North, still in Canada, the next stop is Resolute Bay, ICAO CYRB and recognised in X-Plane FMS and the two flight planner plug ins. 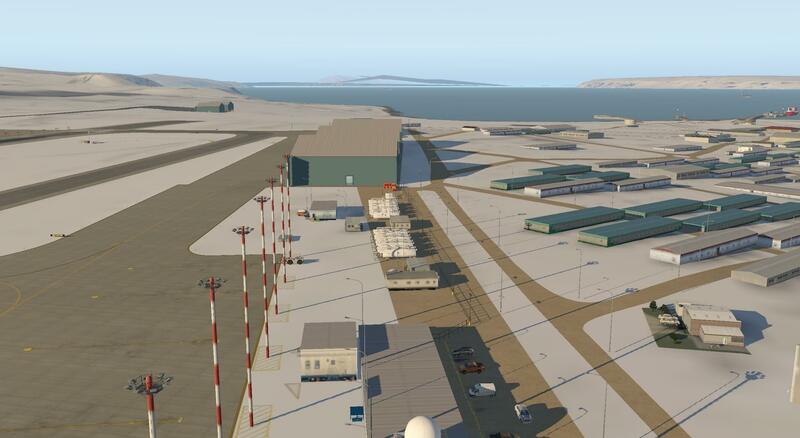 The airport is located at Resolute, Nunavut, Canada, and is operated by the government of Nunavut. Resolute or Resolute Bay (Inuktitut: Qausuittuq literally “place with no dawn”) is an Inuit hamlet on Cornwallis Island in Nunavut, Canada. It is situated at the northern end of Resolute Bay and the Northwest Passage and is part of the Qikiqtaaluk Region. Resolute is one of Canada’s northernmost communities and is second only to Grise Fiord on Ellesmere Island (Alert and Eureka are more northerly but are not considered towns – just military outposts and weather stations). It is also one of the coldest inhabited places in the world, with an average yearly temperature of −15.7°C (3.7°F). As of the 2016 census the population was 198. Like in most other northern communities, the roads and most of the terrain are all gravel. It is one of the northernmost airfields in Canada to receive scheduled passenger airline service. The airport has served as a major transportation hub in the Canadian Arctic. 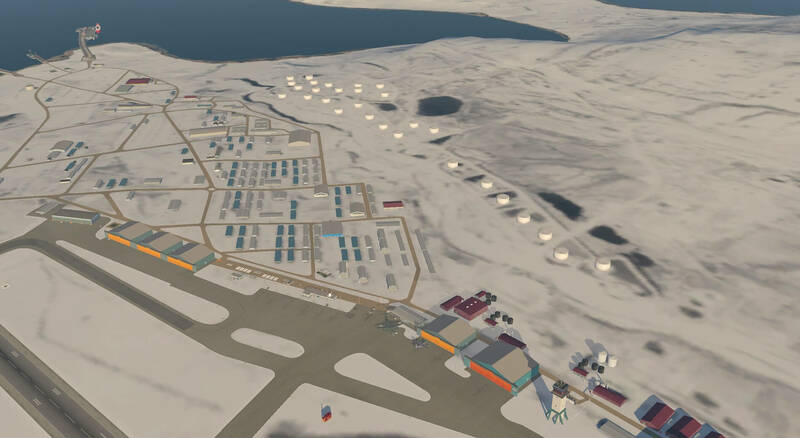 Today the airport is an important refuelling stop for aircraft passing through to other places in the high Arctic such as CFS Alert, Eureka and Mould Bay. 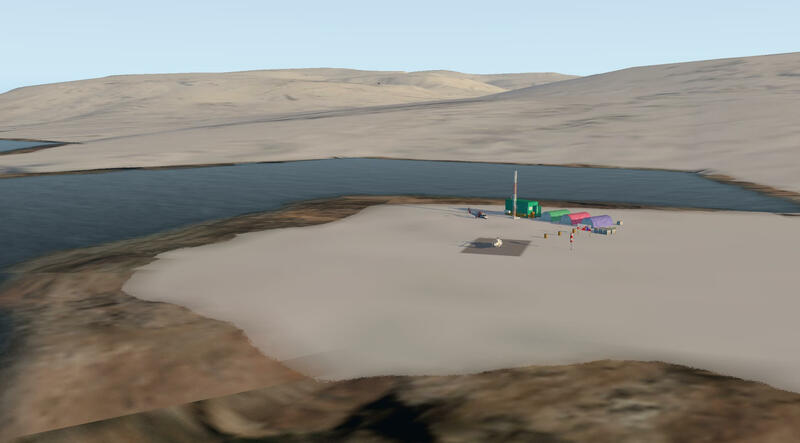 Unlike some airports in Nunavut, Resolute is equipped with an ILS landing system frequency 110.30 MHz, allowing for large commercial aircraft operations. The VOR/DME (YRB) frequency 112.10 MHz is located near the airport as is the NDB (RB) with a frequency of 350kHz. The airport is not equipped with radar. Historically, the airport was served by several airlines operating direct, no-change-of-plane scheduled passenger jet service from such Canadian cities as Calgary, Edmonton, Montreal, Ottawa, Winnipeg and Yellowknife. 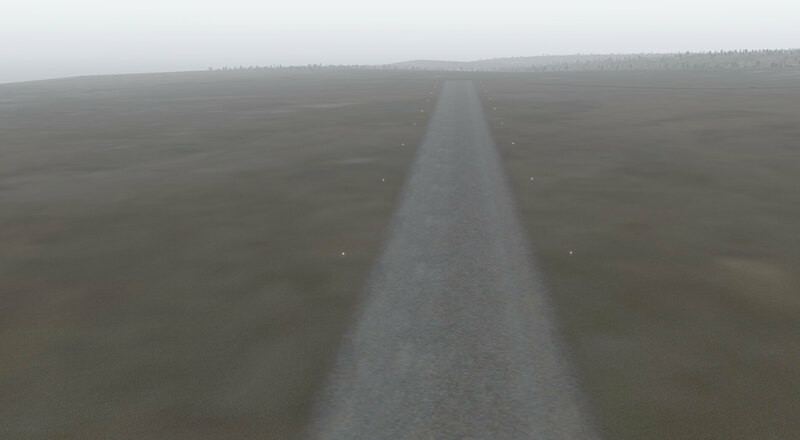 The runway is again modelled as a gravel strip with both side and centre lighting. 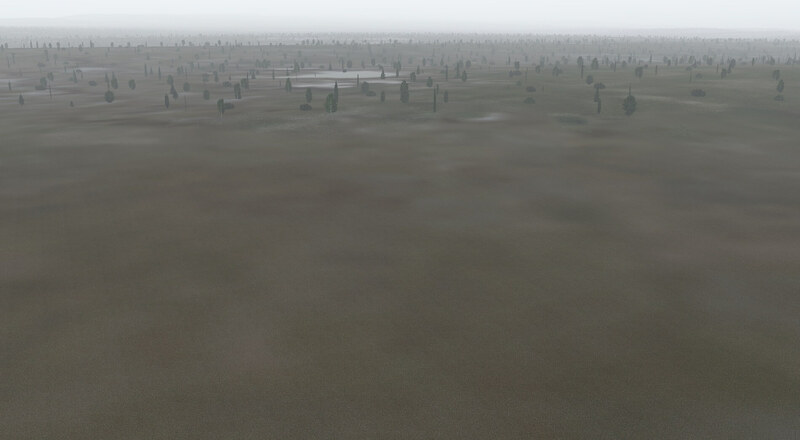 The surrounding vegetation is grass with no trees. Very little snow and ice is apparent but the area appears much flatter than Arctic Bay and large expanses of water are nearby. 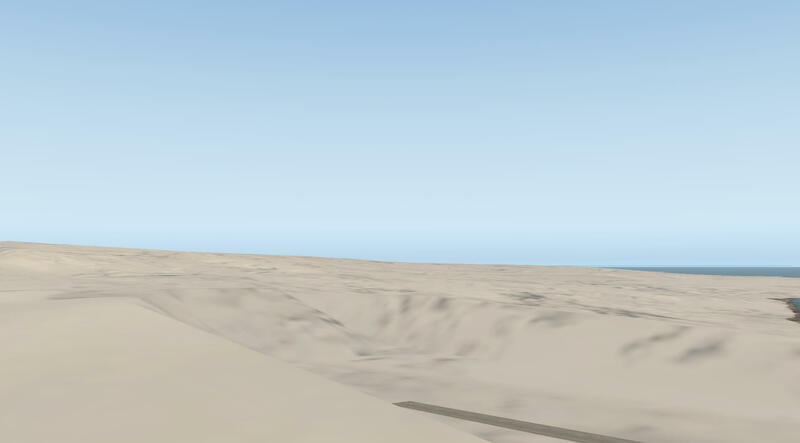 The airfield VOR/DME is modelled next to the runway. The flat area means that good visibility allows long views in to the distance and makes the runway visible from quite a distance in the air. 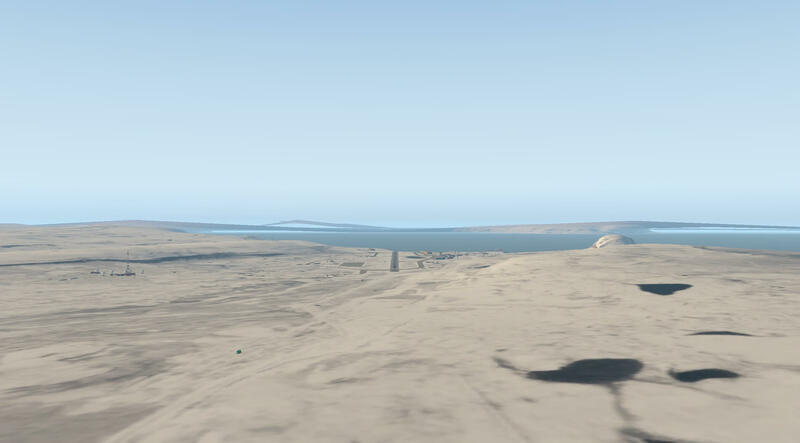 Apart from the VOR/DME no buildings or infrastructure are modelled. Light and shadow are used to good effect and the clear northern skies allow for good views of the setting sun. 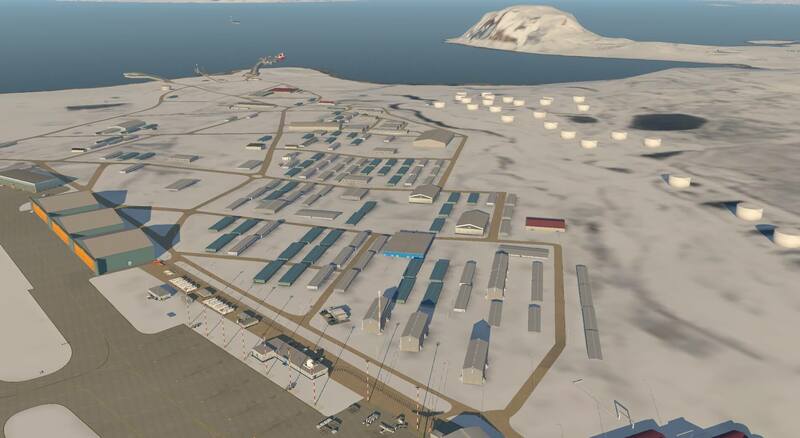 The next airfield on the tour is Grise Fiord. 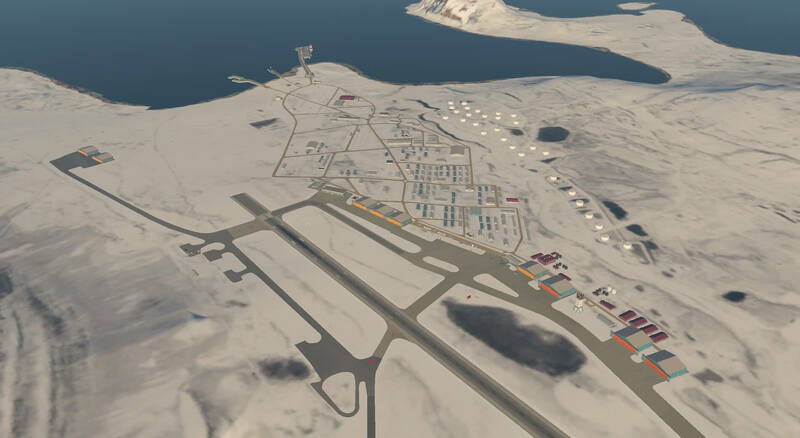 The airport, ICAO: CYGZ recognised by X-Plane FMS and both flight planners, is located in Grise Fiord, Nunavut, Canada, and is operated by the Government of Nunavut. Grise Fiord, (Inuktitut: Aujuittuq, “place that never thaws”) is an Inuit hamlet in the Qikiqtaaluk Region in the territory of Nunavut, Canada. 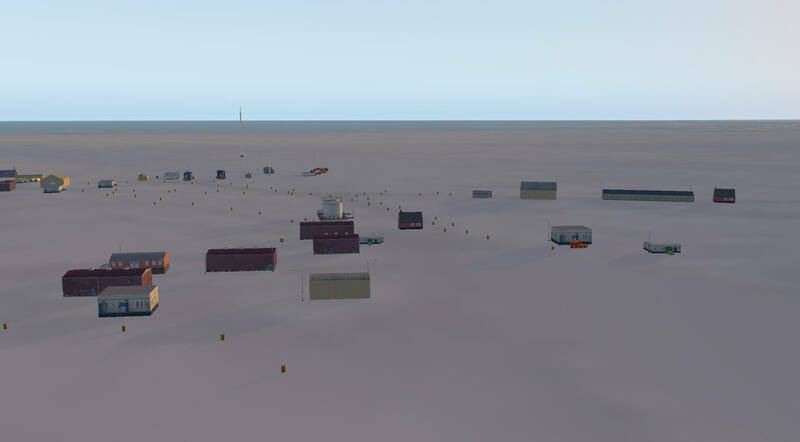 Despite its low population (129 residents as of the Canada 2016 Census), it is the largest community on Ellesmere Island. It is also one of the coldest inhabited places in the world, with an average yearly temperature of −16.5°C (2.3°F). Located at the southern tip of Ellesmere Island, Grise Fiord is one of three permanent settlements on the island. Grise Fiord lies 1,160 km (720 mi) north of the Arctic Circle and sits within the Arctic Cordillera mountain range. The name means “pig inlet” in Norwegian and was named by Otto Sverdrup from Norway during an expedition around 1900. He thought the walrus in the area sounded like pigs. There are no connecting roads on Ellesmere Island, so Grise Fiord is connected to the rest of the world by the airport. It is one of the most difficult approaches for aircraft, and it is cautioned that only very experienced pilots attempt the approach. Once a year large ships (sealift) arrive with supplies and fuel. The only building at this airport is the Air Passenger Shelter and the companies that operate there are Air Nunavut using the Super King Air 200 and Kenn Borek Air using the DHC-6 Twin Otter planes. 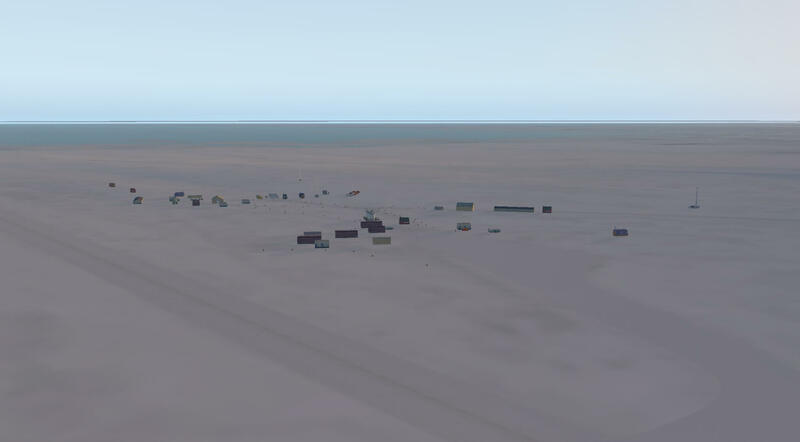 Flights to this airport are usually from Resolute Bay Airport and most of them only carry cargo with few to no passengers. The runways 14/32 are gravel surfaced and 1675ft (511M) in length with an elevation AMSL of 135ft (41M). There is a helipad at the airport and it has an NDB (YGZ) with a frequency of 365 kHz. 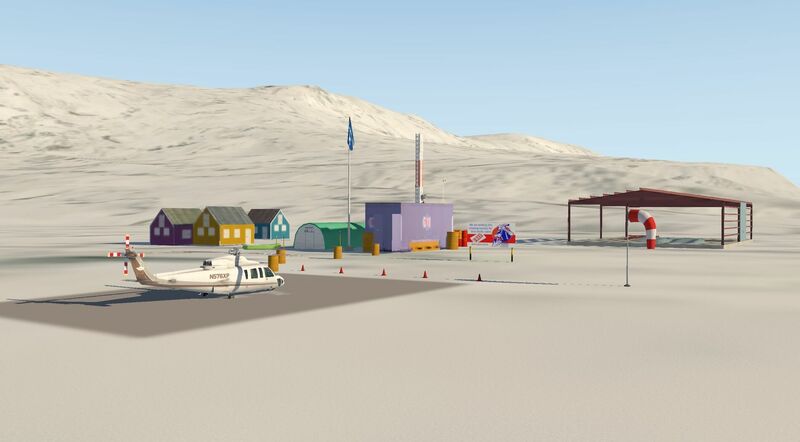 The airfield is well modelled with the passenger shelter on the airfield and the hamlet of Grise Fiord just outside the perimeter fence. 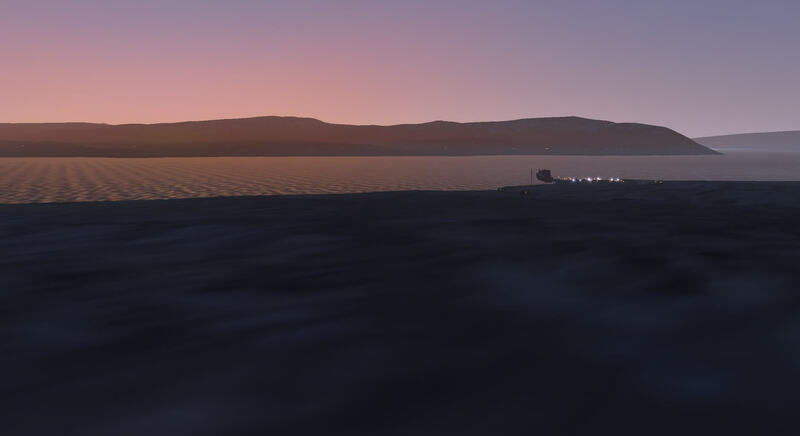 The location is spectacular viewed in any light but twilight shows off the lighting modelled for the venue and clearly illustrates the difficulty in the approach to the runway. 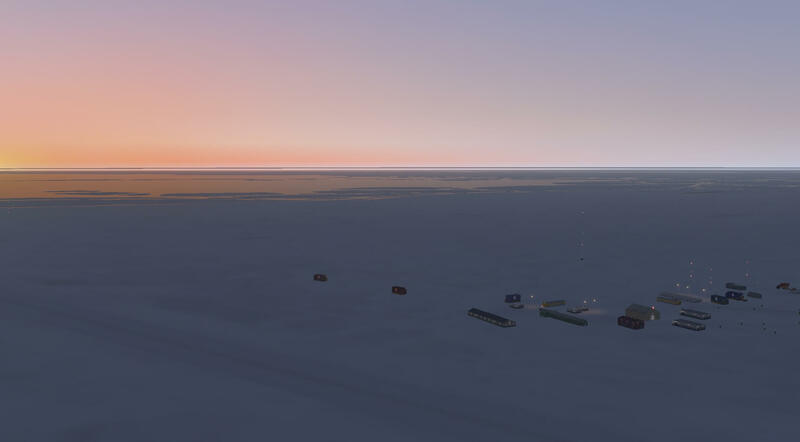 Having moved this far north there is plenty of ice and snow to view and the equipment and fuel tanks at the airfield are modelled within this. During daylight the snow and ice reflect the light very realistically and shadow is used to good effect. Colours are vivid and varied. Whether viewed close up or at a distance the modelling remains clear and visible. The helipad is modelled at one end of the facility. 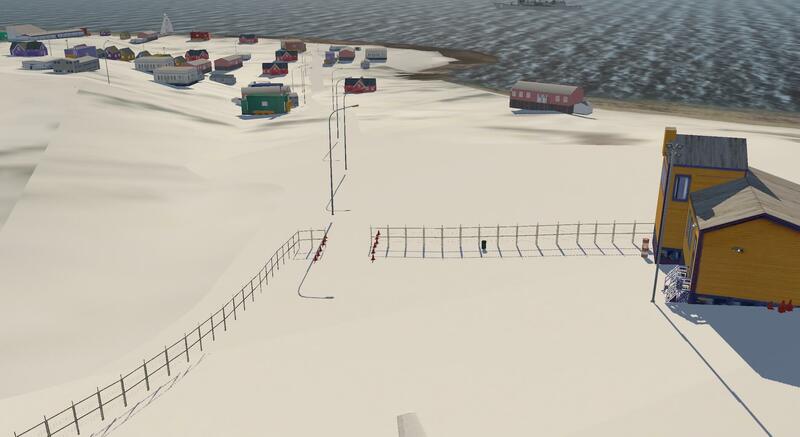 This is very good and impressive scenery immersing the user in this cold and less than hospitable environment and clearly showing how important this air link is to the community. I have never been to Grise Fiord but the scenery certainly recreates the hamlet as it is described. 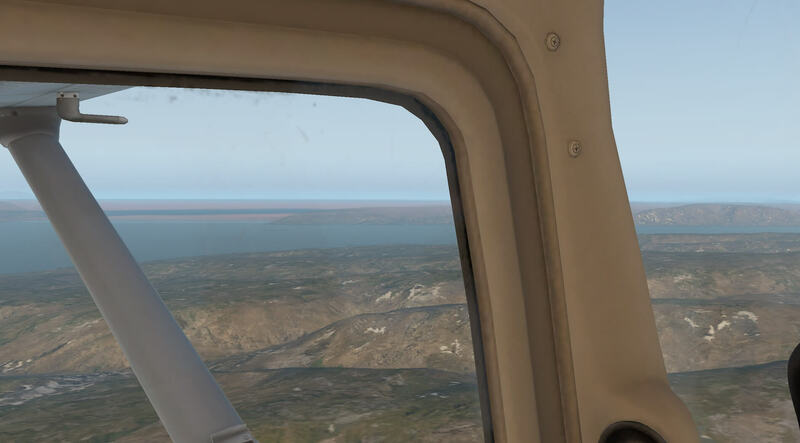 The next stop is King Christian Airport and the code given CA0191 is not recognised by X-Plane FMS or the flight planning plug ins. 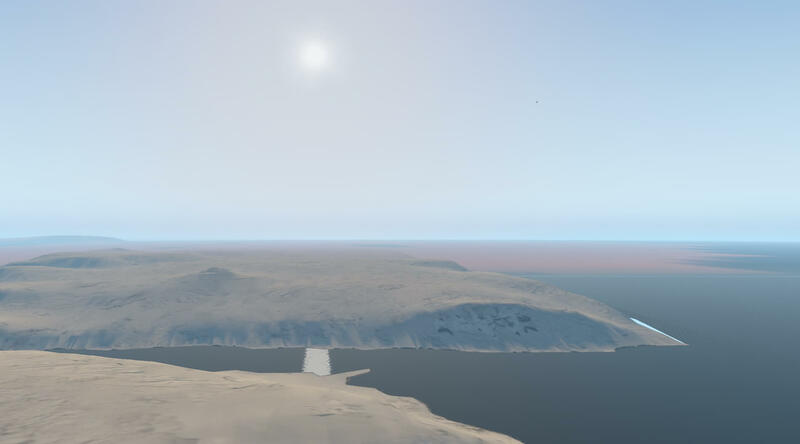 King Christian Island is an uninhabited member of the Canadian Arctic Archipelago in the Sverdrup Islands, a part of the Queen Elizabeth Islands archipelago, in the Qikiqtaaluk Region of Nunavut, Canada. It lies in the Arctic Ocean, 13.5 km (8.4 mi) from the southwestern coast of Ellef Ringnes Island, separated by the Danish Strait. The island has an area of 645 km2 (249 sq mi), measures 38.8 kilometres (24.1 mi) long and 25.7 kilometres (16.0 mi) wide. The website airport database.net confirms the airport code but describes it as closed and there is very limited information elsewhere on the net. 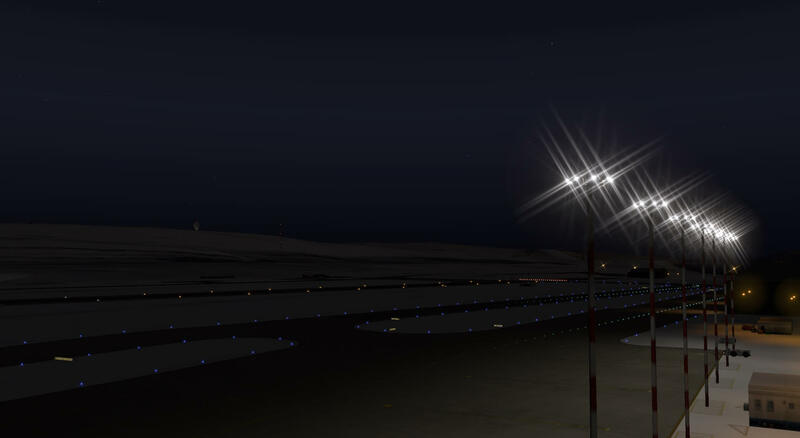 The airport is modelled as gravel strip with central lighting. There are no navigation aids with the airport and no infrastructure or buildings are modelled. 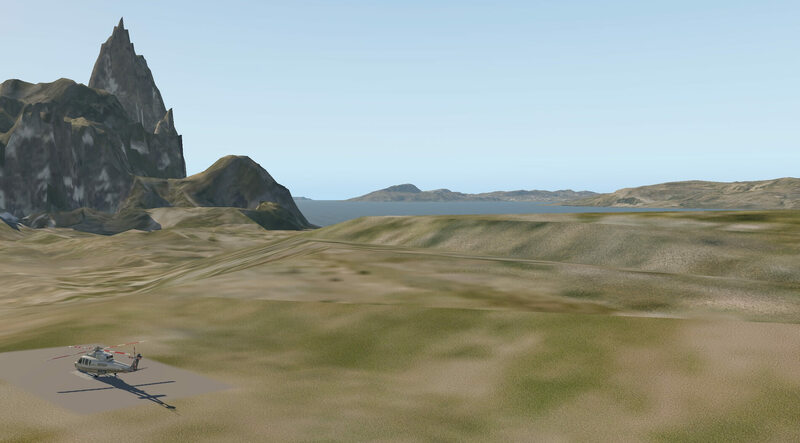 The surrounding scenery is modelled to look barren, flat and open. Again there is close proximity to the sea so VFR flight may be possible. 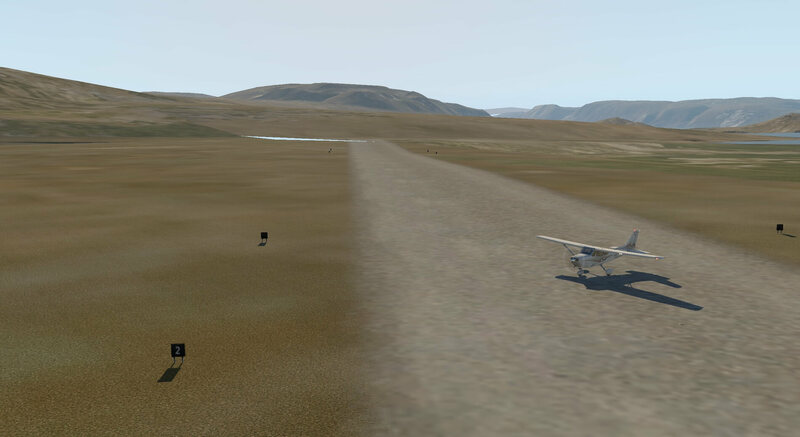 Malloc Dome Airfield follows King Christian and is again a gravel strip with central lighting. It is very similar to the previous venue with no navigational aids, infrastructure or buildings modelled. It has the code CA 0221 and is not recognised by X-Plane FMS or the two flight planning plug ins. 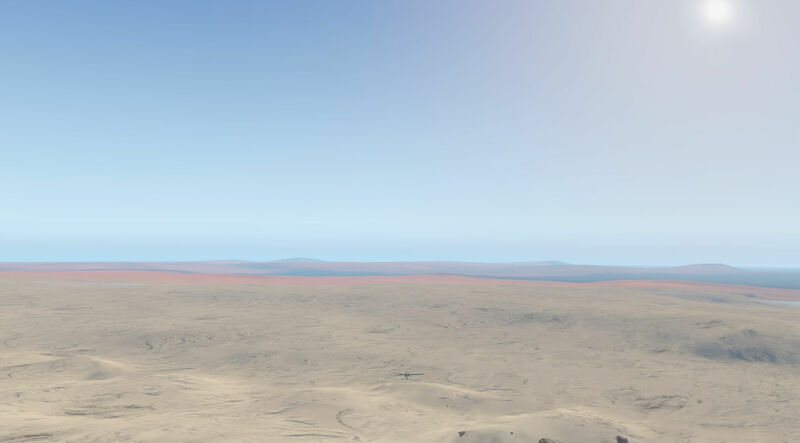 Scenery around the airfield is barren and flat. There is no information available on the internet. 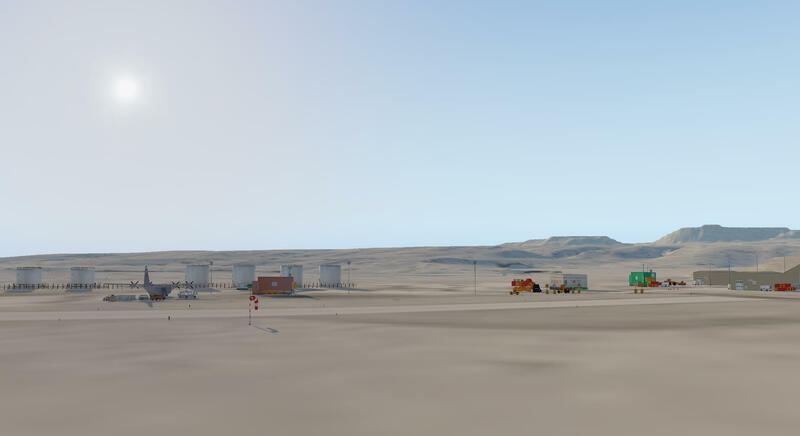 Both of these airfields are modelled in remote areas with sparse detail but do use light, shadow and colour very well to provide the atmosphere of small isolated airfields and provide landing and flight opportunities in the less occupied areas. 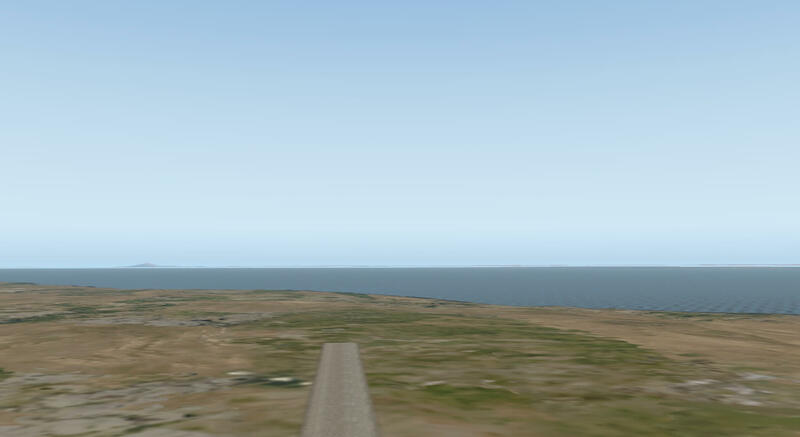 The next stop is Eureka Aerodrome, ICAO CYEU recognised by X-Plane FMS and both flight planners, which has an NDB (YEU) with a frequency of 205 kHz and waypoint YEU. The airfield is private and is run by Environment Canada. 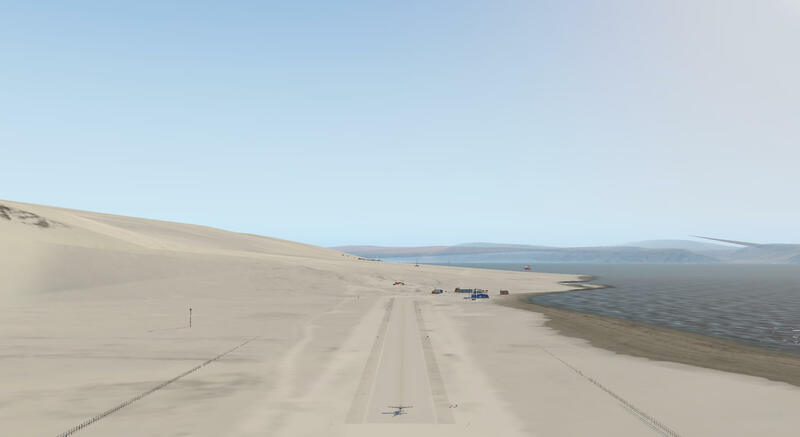 Its runway 10/28 is surfaced in gravel, is 4802 ft (1464M) long and has an elevation AMSL of 272ft (83 M). 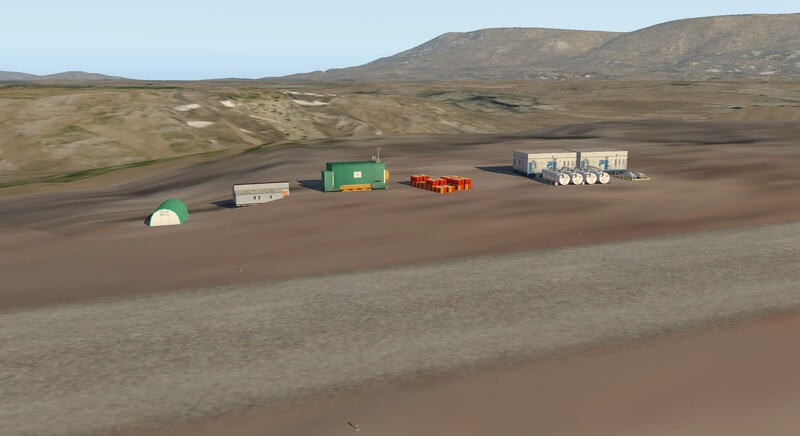 Eureka is a small research base on Fosheim Peninsula, Ellesmere Island, Qikiqtaaluk Region, in the Canadian territory of Nunavut. It is located on the north side of Slidre Fiord, which enters Eureka Sound farther west. It is the third-northernmost permanent research community in the world. Eureka has the lowest average annual temperature and the lowest amount of precipitation of any weather station in Canada. Eureka was founded on April 11, 1947, as part of a requirement to set up a network of Arctic weather stations. 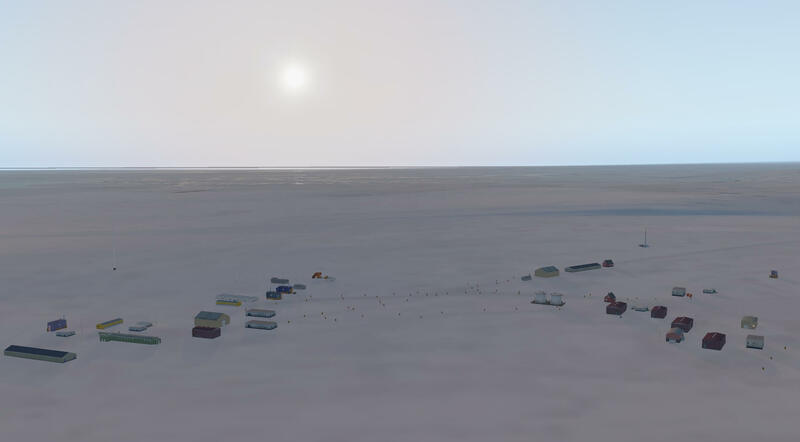 On this date, 100 tonnes of supplies were airlifted to Ellesmere Island, and five prefabricated huts were constructed. Regular weather observations began on January 1, 1948. The station has expanded over the years. At its peak, in the 1970s, at least fifteen staff were on site; in 2005, it reported a permanent population of zero with at least 8 staff on a continuous rotational basis. Several generations of buildings have since been developed. PEARL is operated by a consortium of Canadian university researchers and government agencies known as the Canadian Network for Detection of Atmospheric Change. The modelling itself shows different groups of buildings of mixed types. The buildings form their separate areas which seems in keeping with the description of the base. 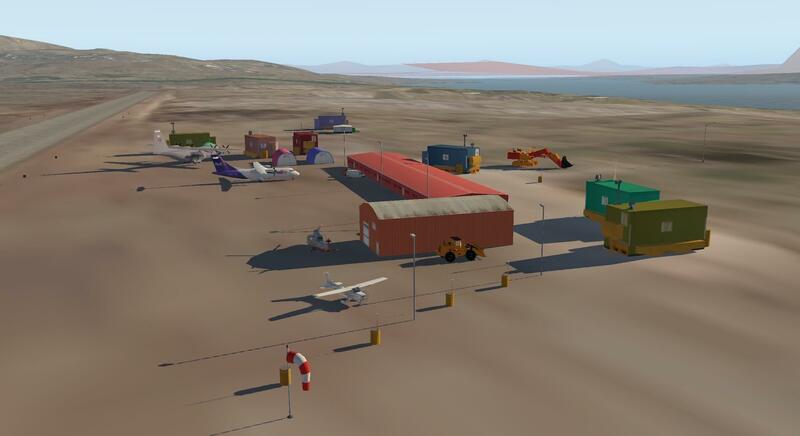 The detail of the base includes parked aircraft, shipping, the NDB and construction vehicles. 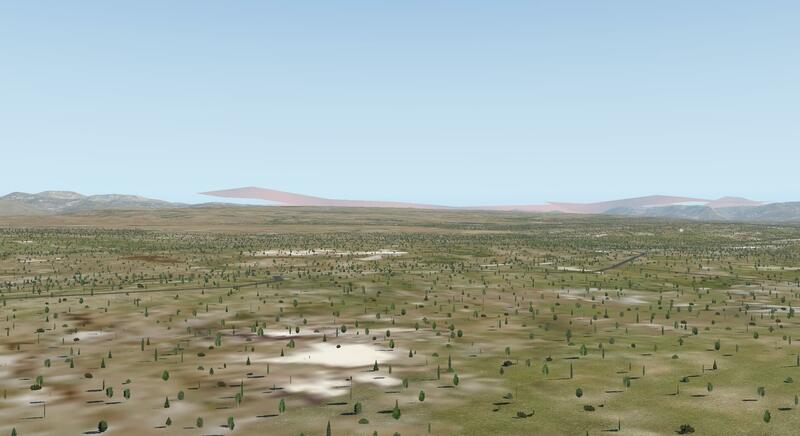 The area is modelled without snow and the ground appears barren and lacking vegetation. Colours are vivid and varied and the runway is modelled in gravel. 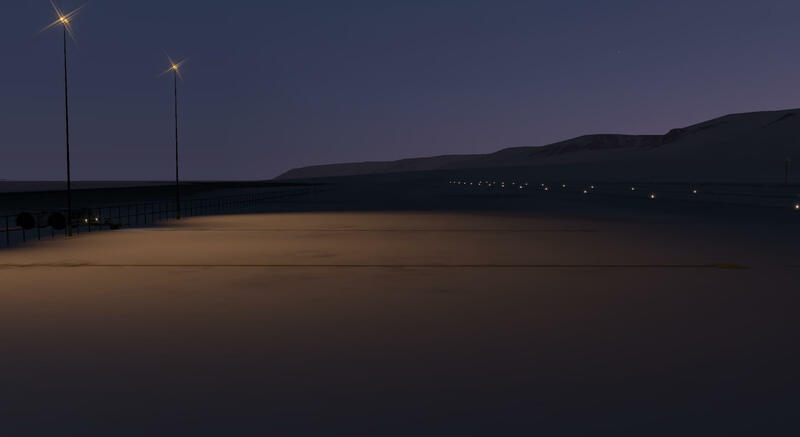 At times of low light, which are modelled to vary by time of year, the runway and facilities are lit in a very realistic and helpful way. Light, shadow and reflections during daylight hours are very effective and add to the realism of the scenery. 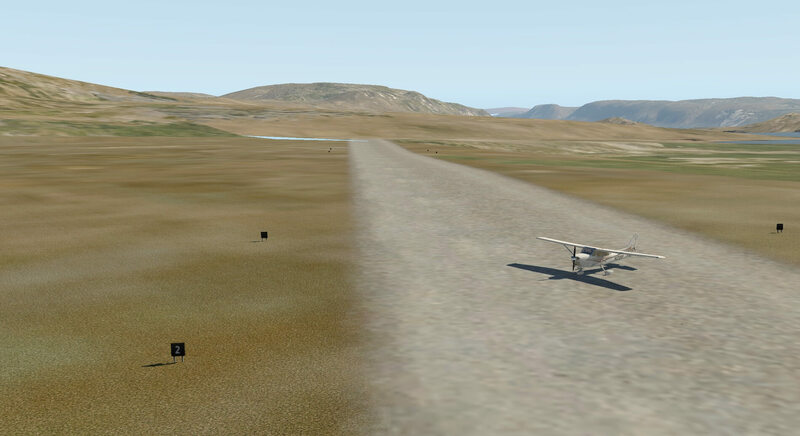 The journey continues to Isachsen Station, ICAO CWIC not recognised by X-Plane FMS nor the two flight planners. 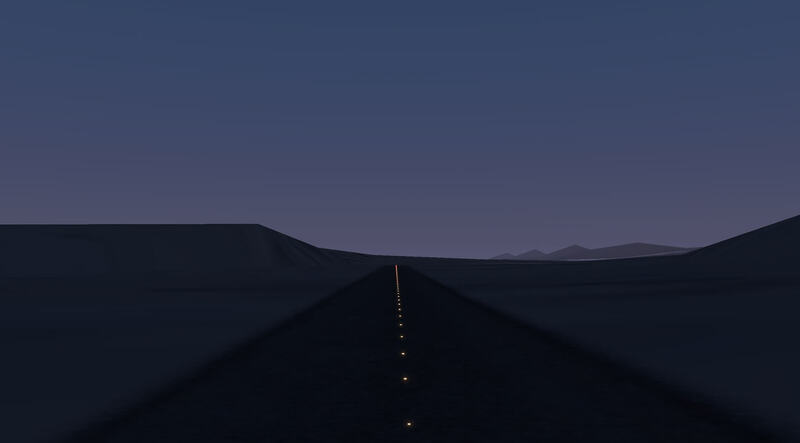 This is another remote gravel strip and in this case there is no lighting on the runway. Isachsen is a remote Arctic research-weather station named after the Norwegian explorer of the Arctic, Gunnar Isachsen. It is located on the western shore of Ellef Ringnes Island in the Sverdrup Islands, in the territory of Nunavut in Canada. Isachsen Station was established to participate in a joint Canadian-American weather observation program. Isachsen Station operated from April 3, 1948 through September 19, 1978. Regular weather observations began on May 3, 1948. According to the Environment and Climate Change Canada, Isachsen and the surrounding area has the worst weather in Canada with a Climate Severity Index of 99 out of a possible 100. During the 1950s, Isachsen Station was primarily collecting radiosonde observations and this information was used to complete the North American data, primarily used to produce weather forecasts over the North Atlantic Ocean, Greenland, and Iceland, and long-range weather forecasts for Western Europe. 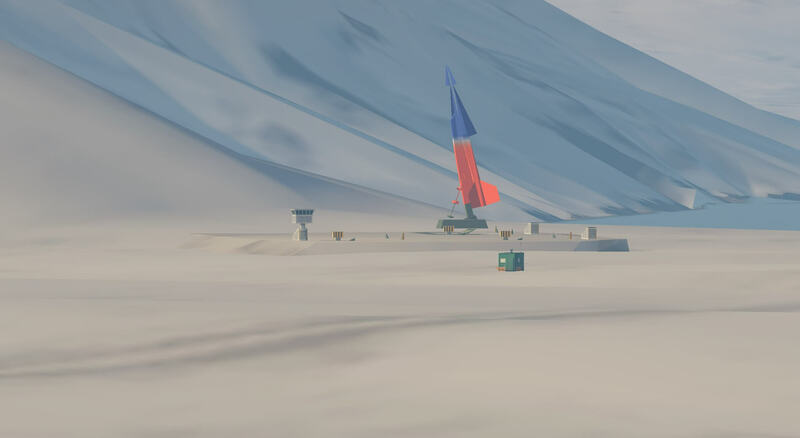 The Isachsen Station was located in an extremely isolated place, with supplies and new personnel flown in by the Royal Canadian Air Force, usually twice a year. The eight-man staff at Isachsen usually consisted of four Americans and four Canadians. All communication to and from Isachsen Station was via shortwave radio radiotelegraphy. 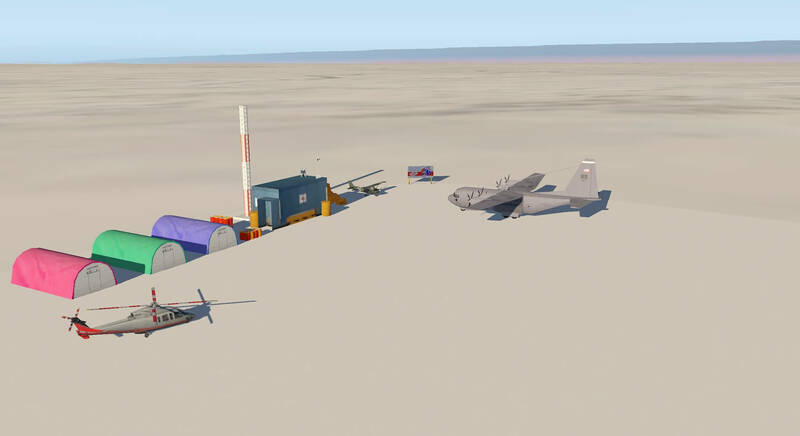 Fuel oil and diesel fuel for heating and cooking, and for the station’s electric generators, respectively, were shipped to Isachsen by transport planes in standard metal fuel barrels. During the summer of 1958, the Isachsen station was rebuilt using prefabricated buildings that had been airlifted in along with about a dozen construction personnel. On October 31, 1971, the United States withdrew from participation in the weather program at the site. In 1971, the Canadian government made a significant investment in Isachsen to upgrade its buildings. 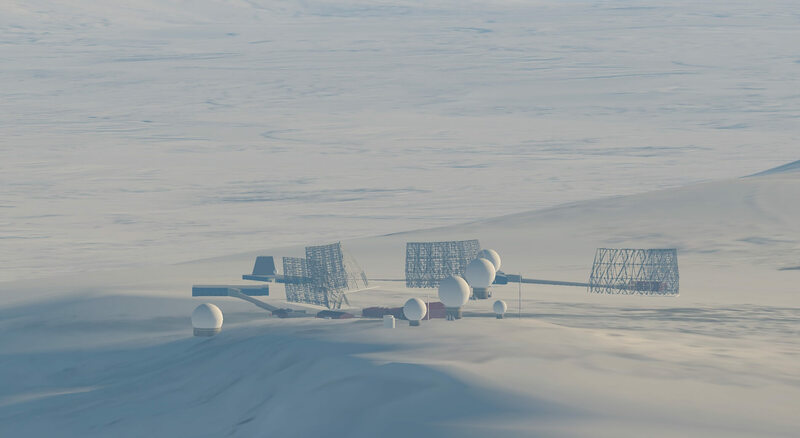 Then, in 1978, as a cost-cutting measure, the government decided to close one high Arctic station; Isachsen Station was selected, and it was closed down during that same year. The last manned weather observations were taken on July 31, 1978. An Automated Surface Observing System was placed at the site in 1989, linked by satellite communications to southern Canada. Isachsen is now uninhabited. The model shows just the runway with surrounding scenery which is probably near to the real thing as Environment Canada assessed the site to be able to remove contaminants etc. from the area. There will doubtless be some remains of the station and an aircraft that crashed during the time the site was in use which images on the internet confirm. There are no navigational aids at the airstrip and the co-ordinates are 78°47’36″N 103°32’36”W. 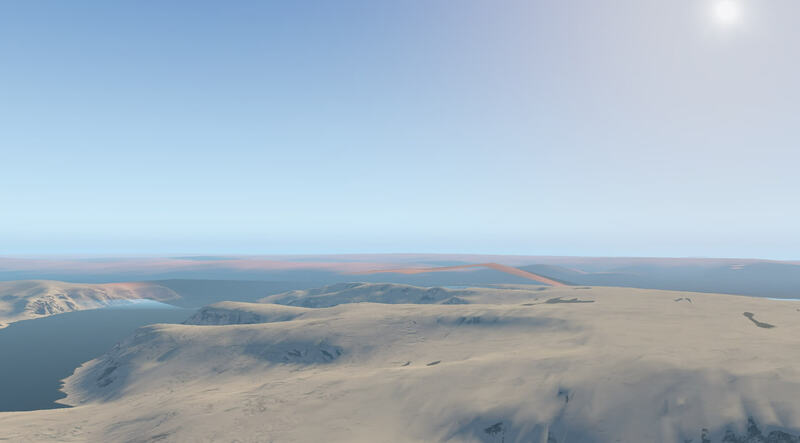 The model is created with no snow and ice and the surrounding area appears remote and lacking landmarks and vegetation, something to bear in mind for VFR, again this is likely to be highly realistic given the location and is not intended as a criticism. Light, colours and reflections remain of a high quality and the whole area has a real feel of isolation. I have not been brave enough to visit! 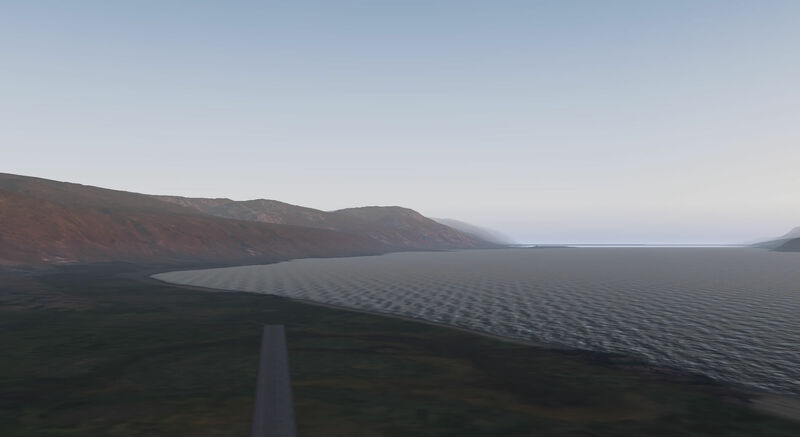 Moving on to Tanquary Fiord Airstrip, ICAO CJQ6 recognised by X-Plane FMS and both flight planners, the quality of the scenery continues. Tanquary Fiord Airport is located at the southern side of Tanquary Fiord, Nunavut, Canada, close to the end of the fiord. It is located within Quttinirpaaq National Park, and is maintained by Parks Canada. It serves as the main access to the park for tourists. Hikers to Lake Hazen, which is located 70 km (43 mi) to the northeast, start from Tanquary Camp. In 1963, the Defence Research Board began ‘Operation Tanquary’ in the area, with a focus on oceanography. The operation concluded in 1972. As the fiord is in a remote location, there is little human habitation. A Warden Station is staffed by Parks Canada during the summer months, and Tanquary Fiord Airport is located nearby. It is possible to reach the area via charter aircraft, or increasingly, via icebreaker cruise ships. 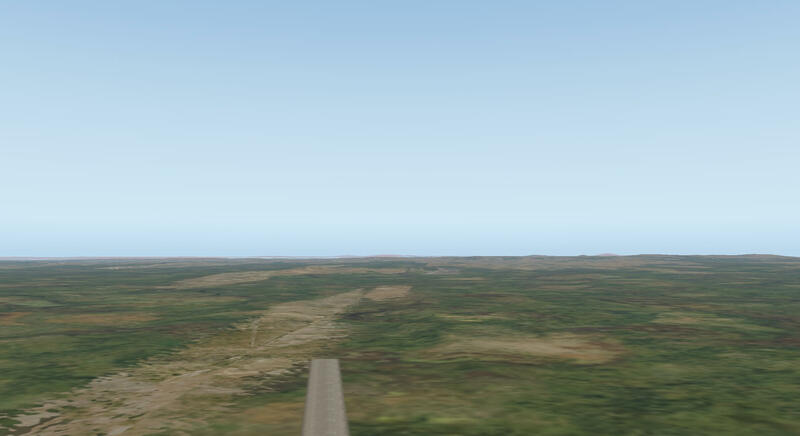 The runway 03/21 is 3700ft (1128M) in length and has an elevation of 50ft/15M AMSL. 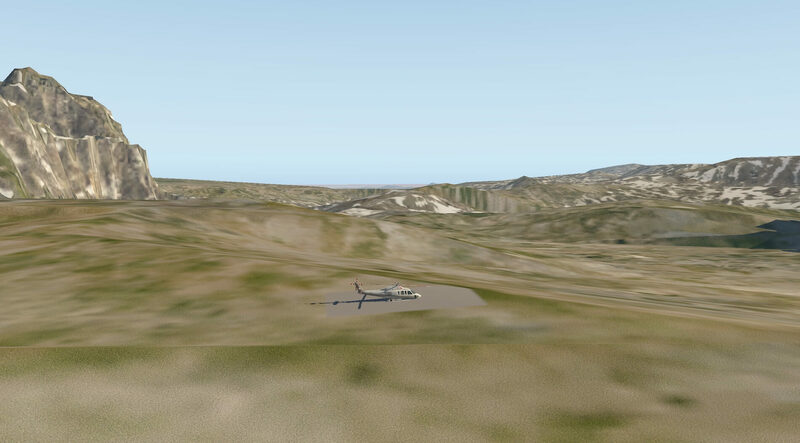 The runway is modelled in gravel and the surrounding scenery, water, land and mountains is very impressive. 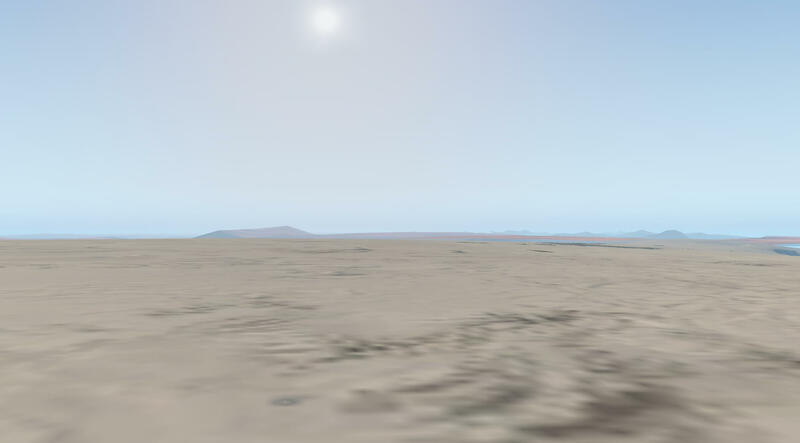 The area is modelled with some patches of snow and ice, minimal vegetation and a barren landscape. There are no navigational aids modelled, the real airstrip is not described as having any, and the runway is unlit. 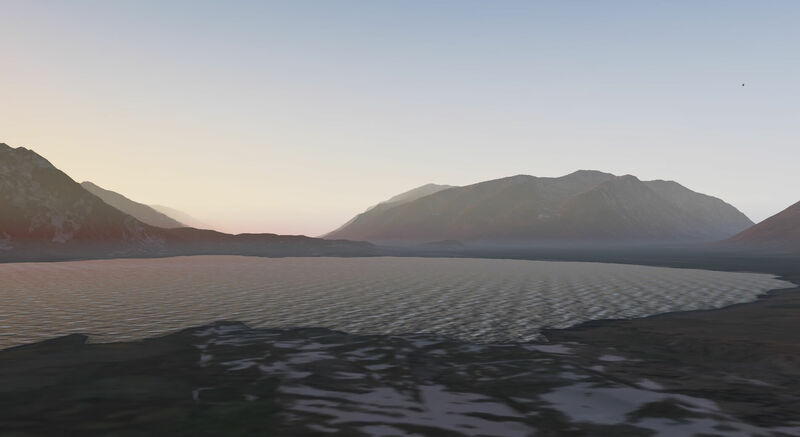 Whilst there are no buildings or man made points of reference the surrounding mountains and the proximity to the shore of the fiord may help VFR flight. 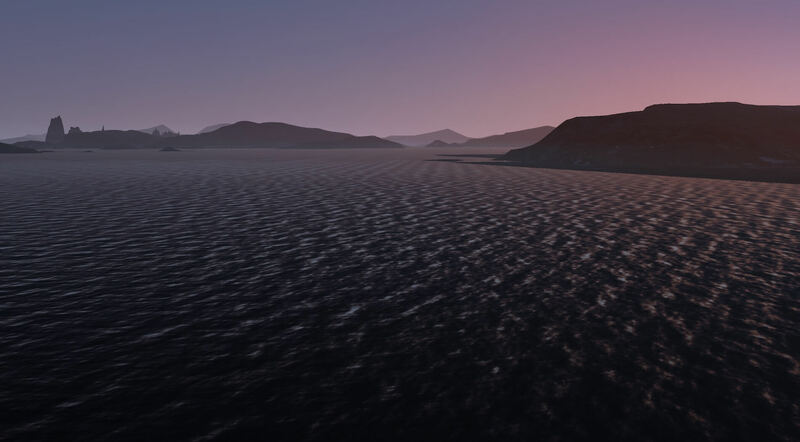 The change of light and shadow on the scenery as time and seasons change is very impressive and these details, and the realistic textures of land and water, allow the user to become immersed in the scenery. 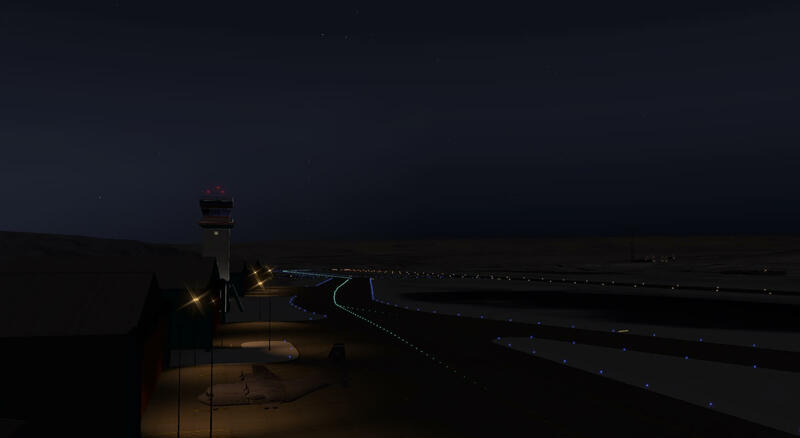 The next stop is Alert Airport, ICAO CYLT recognised by X-Plane FMS and both flight planners. It has an NDB with a frequency of 305 kHz and waypoint LT. 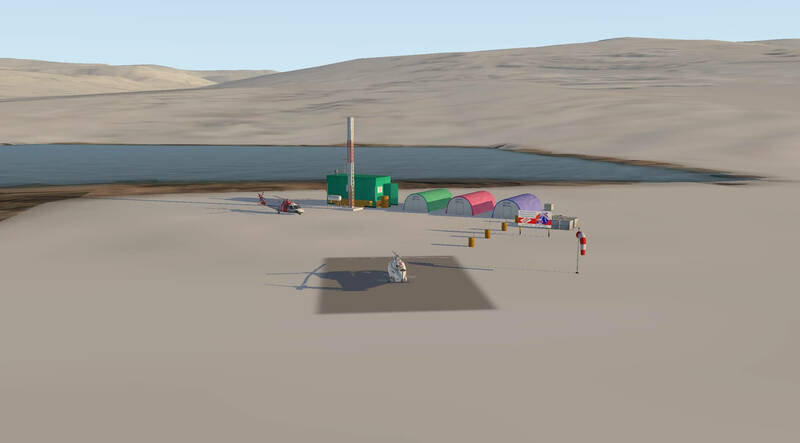 Alert Airport is located at Alert, Nunavut, Canada, approximately 830 km (520 mi) south of the true Pole. Alert is the northernmost permanently inhabited place in the world and is closer to Moscow than it is to Ottawa. As of the 2016 census the population was reported as 62. It takes its name from HMS Alert, which wintered 10 km (6.2 mi) east of the present station, off what is now Cape Sheridan, in 1875–1876. 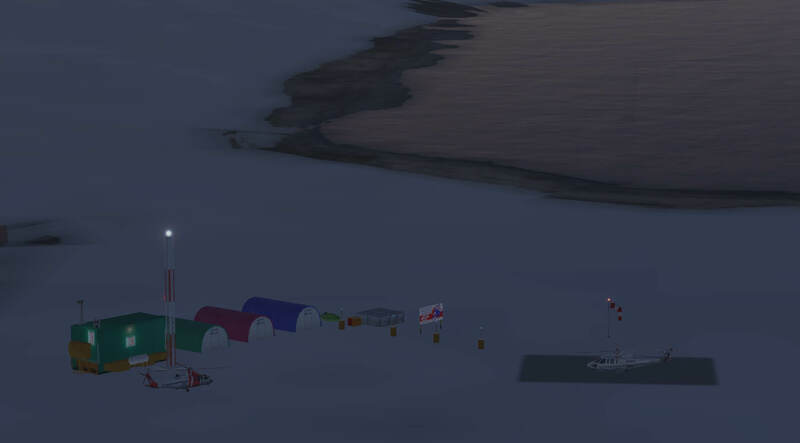 Alert has many temporary inhabitants as it hosts a military signals intelligence radio receiving facility at Canadian Forces Station Alert (CFS Alert), as well as a co-located Environment Canada weather station, a Global Atmosphere Watch (GAW) atmosphere monitoring observatory, and the Alert Airport. A weather station was established on the site in 1950, and in 1957 construction began on the military facilities which are still in use to this day. It is the northernmost airport in the world. Radar and navigation equipment are trailer units that can be moved around the airport. Two bulldozers are used to grade the runway when needed. With Canada’s commitment to the global war on terrorism following the September 11, 2001 terrorist attacks in New York City and Washington, D.C., CFS Alert has received renewed and increased funding to expand its SIGINT capabilities. On April 1, 2009, the RCAF officially took responsibility for CFS Alert from Canadian Forces Information Operations Group (CFIOG). The runway 05/23 is surfaced in gravel and is 5500ft (1676M) long with an elevation of 100ft/30M AMSL. 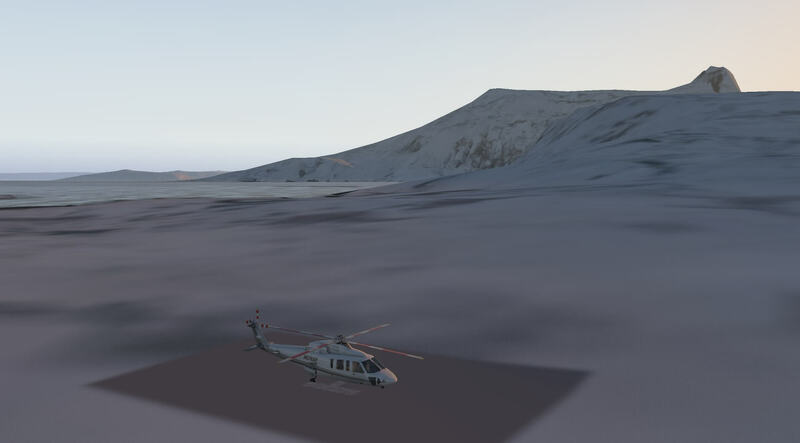 The scenery here is modelled with a covering of ice and snow and the water next to the base is also covered in ice. True to the description given of the base there are clearly several separate sections modelled with their own buildings, vehicles and facilities and the bulldozers used to the maintain the runway are present. Alert has a Helipad and this is modelled amongst other equipment. There are parked aircraft and service vehicles modelled at the station all giving interest and life to the scenery. 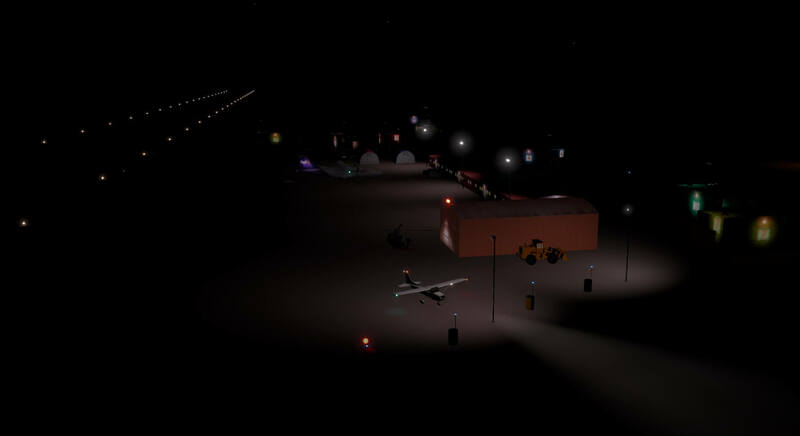 At night the runway and facilities are clearly lit and the use of light, texture and shadow during daylight hours increases the realism of the airport. Colours are bright, clear and appropriate and the NDB is modelled on the field. The vastness of the landscape is well presented and shows the remoteness of these venues and the isolation it creates. The use of aircraft is essential in this area. Again this base is modelled slightly differently from those that have gone before giving the scenery a rich variation of venues and items of interest. Moving south and more towards Greenland we arrive at Fort Conger. 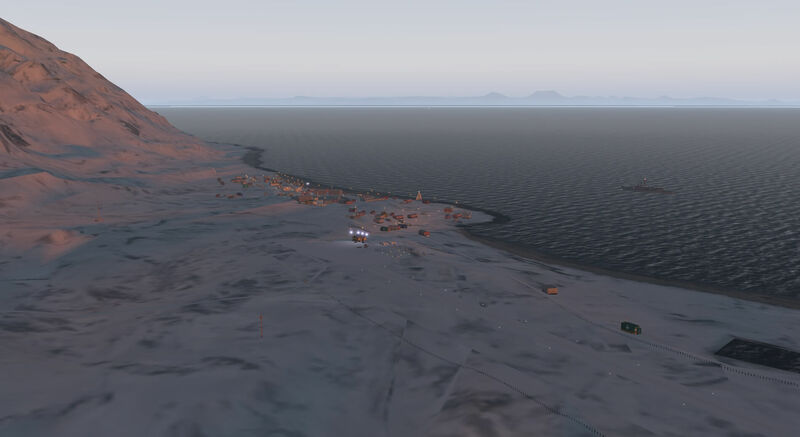 (The ICAO given is CONG but I found this was recognised by X-Plane FMS as being a code for elsewhere in the world and this Fort Conger is not recognised by X-Plane FMS or the two flight planners. The location for the base is 81° 44′ 37″ N – 64° 46′ 33″ W. Fort Conger is a former settlement, military fortification, and scientific research post in Qikiqtaaluk, Nunavut, Canada. It was established in 1881 as an Arctic exploration camp, notable as the site of the first major northern polar region scientific expedition, led by Adolphus Greely as part of the US government’s contribution to the First International Polar Year. It was later occupied by Robert Peary during some of his Arctic expeditions. In 1991, some of the structures at Fort Conger were designated as Classified Federal Heritage Buildings. Fort Conger is located on the northern shore of Lady Franklin Bay in Grinnell Land, northeastern Ellesmere Island within Quttinirpaaq National Park. 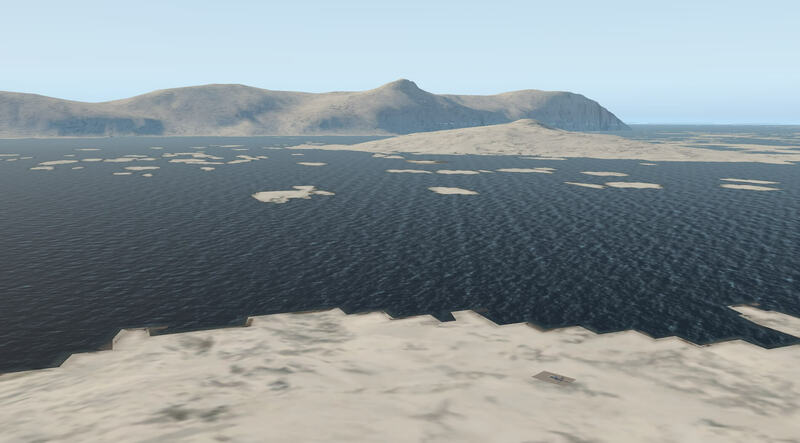 Bellot Island lies across from Fort Conger within Discovery Harbour. Though lacking in timber, the area is characterised by grasses and sedges. The surroundings are rugged and boast high cliffs around the harbour. Now uninhabited, it is one of only a handful of previously manned stations in the Queen Elizabeth Islands. The scenery does not include any buildings or navigational aids. A helipad is modelled in the location of Fort Conger. 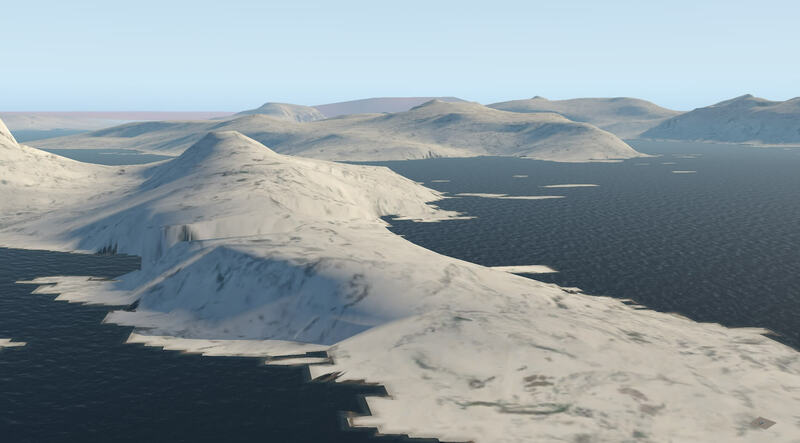 The surrounding area is modelled under snow and ice and the nearby water is well modelled in terms of texture and light. There is no lighting at the venue. 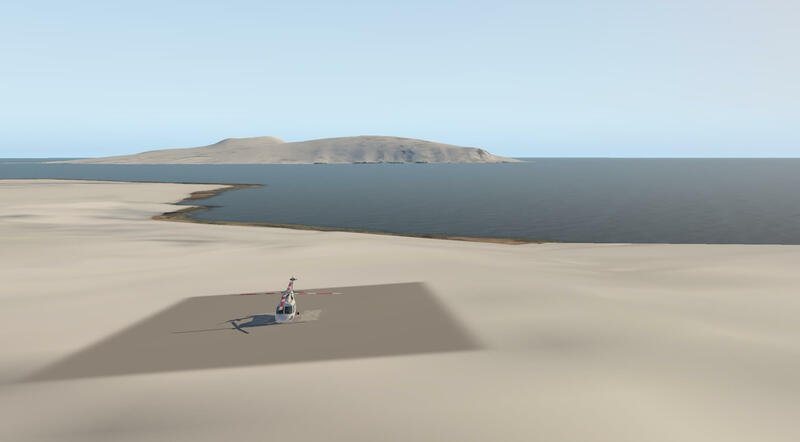 Whilst a limited site in terms of detail this provides the user with the ability to use a helicopter in this area and the surrounding hills and position alongside the water may help with VFR flight. Travelling in to Greenland the first call is at Sioropaluk Heliport. 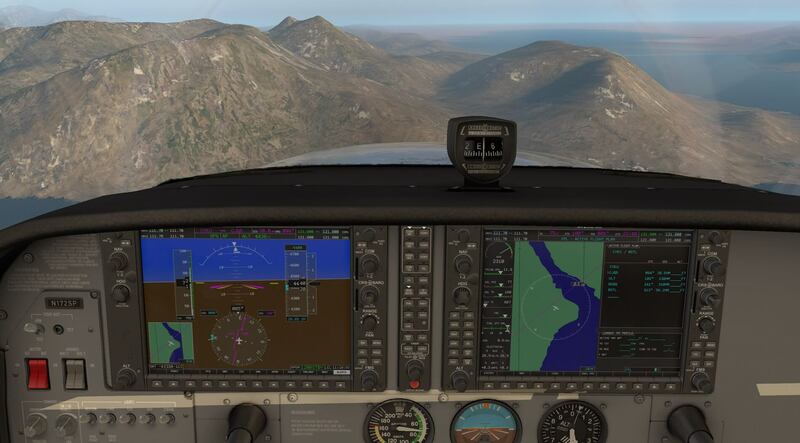 The ICAO given is BGSI but this is not recognised by X-Plane FMS or the two flight planners. Wikipedia gives a slightly different spelling to the location as Siorapaluk Heliport and confirms the ICAO code given as BGSI. 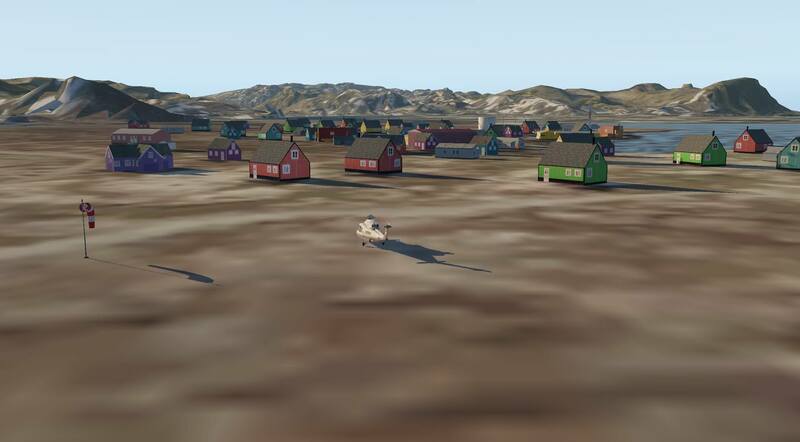 Siorapaluk is a village in the Qaasuitsup municipality in northern Greenland. The heliport is considered a helistop, and is served by Air Greenland as part of a government contract. It is the northernmost aerodrome in Greenland with scheduled civilian flights. Air Greenland operates government contract flights to villages in the Qaanaaq area. These mostly cargo flights are not featured in the timetable, although they can be pre-booked. Departure times for these flights are optimised depending on local demand for a given day. The helipad is gravel and has an elevation of 102ft (31M) AMSL. The scenery is modelled covered with snow and ice. The helipad is therefore white rather than the darkness of gravel. The helipad is situated next to the village which is modelled with a variety of buildings, mainly houses in clear bright colours. These are well modelled and sit realistically in the scenery. Again the remoteness of this settlement is created through the scenery. The village has a small jetty into the water next to it and several boats are modelled alongside. The surrounding hills sit imposingly over the settlement making it easy to understand why the helicopter service is essential in the area. In low light the settlement and ships are adequately and sensibly lit creating quite an atmospheric scene. The heliport has no navigational aids and the fact the settlement is modelled may well help with VFR flight. 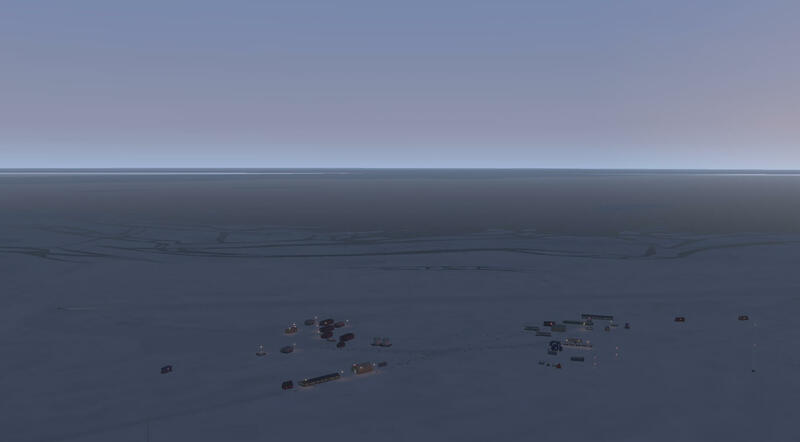 Moving 300 miles (484KM) ENE of Siorapaluk the next visit is NEEM Camp which was a small research facility on the northern Greenland Ice Sheet, used as a base for ice core drilling. There is no ICAO for this airstrip and it is situated at 79°27’1″N / 51°0’21″W. There is only one heavy-duty tent for accommodation of the researchers during summer. Access is by ski-way (snow runway). The acronym NEEM stands for North Greenland Eemian Ice Drilling. 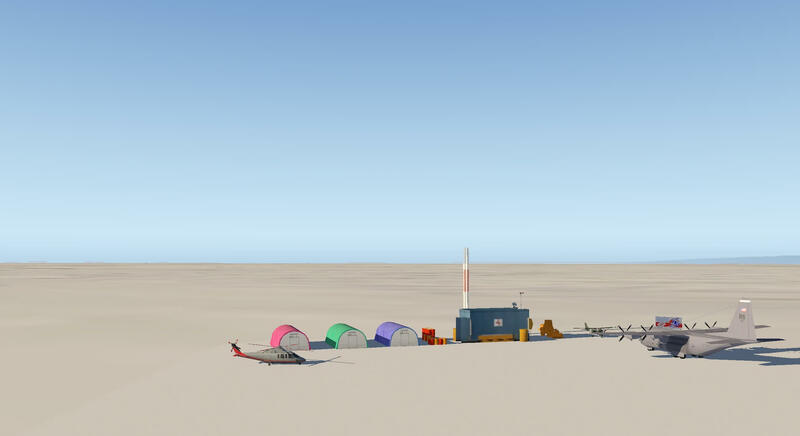 After the conclusion of the drilling activities, the machinery and dome of the NEEM camp was moved to a new location in the NEEM-EastGRIP traverse, forming the EastGRIP camp. The scenery models the ski-way and several buildings. As it is situated inland there is no water for bearings and the camp is situated on a large flat plain so the buildings should be helpful in navigation. 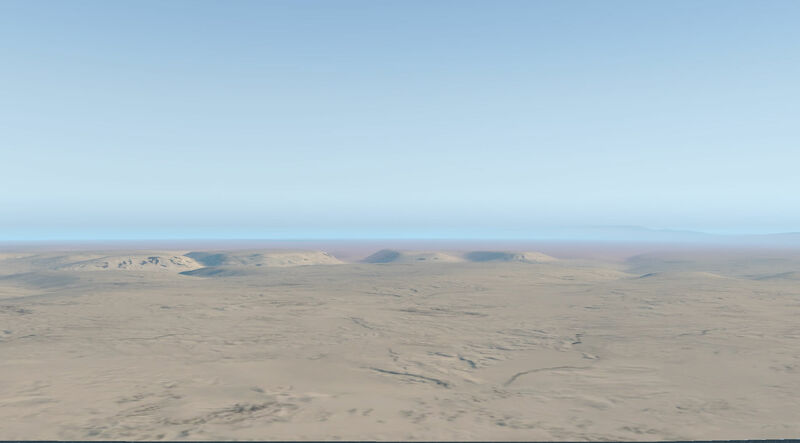 The whole area is modelled as covered in snow and this creates a wide featureless landscape. The camp has several buildings in various colours and looking quite utilitarian in keeping with the nature of the camp. There are some works vehicles and a parked aircraft and helicopter. There are no roads or infrastructure at the camp and the developers have left a message to users on the sign board at the site. At low light there is limited lighting amongst the buildings, in keeping with the nature of the site, and the ski-way has lighting down the centre. A really different option and surface set in a situation not modelled elsewhere in this scenery. 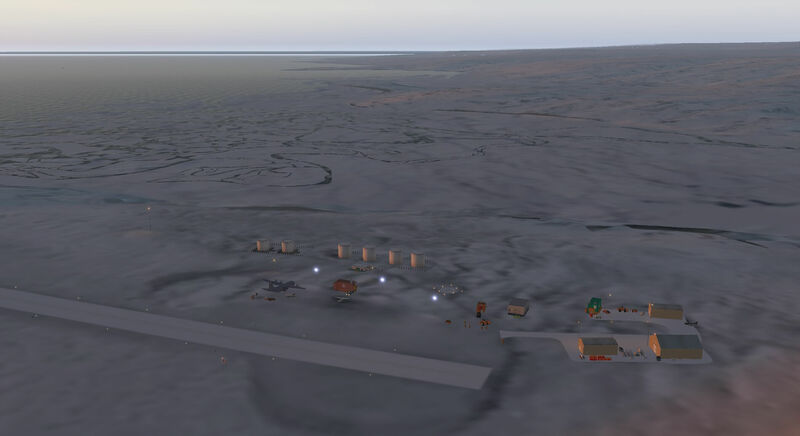 We return to the west coast of Greenland for the next location at at Qaanaaq Airport. 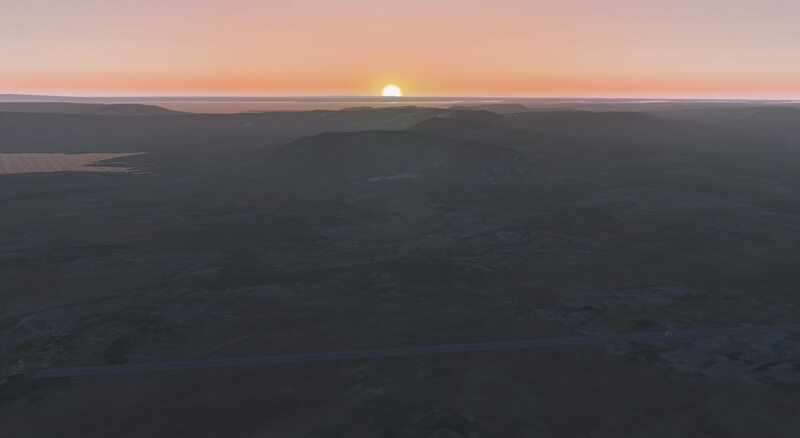 (ICAO BGQQ recognised by X-Plane FMS and the two flight planners.) 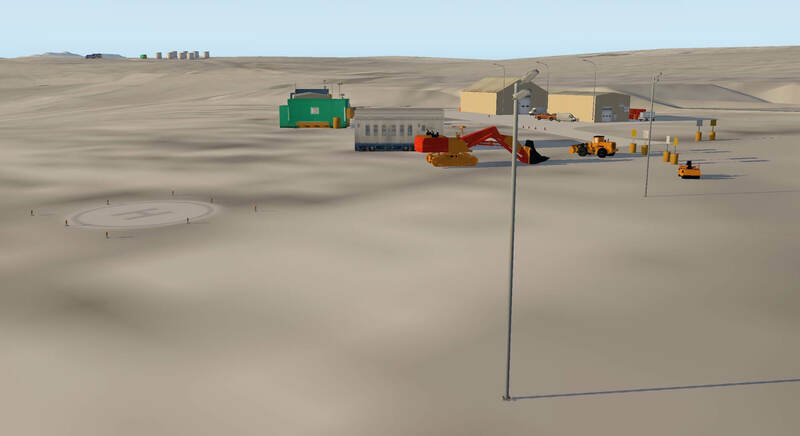 Qaanaaq Airport is located 1.9 NM (3.5 km; 2.2 mi) northwest of Qaanaaq, a settlement in the Qaasuitsup municipality in northern Greenland. Qaanaaq (formerly Thule or New Thule, is the main town in the northern part of the Avannaata municipality in northwestern Greenland. It is one of the northernmost towns in the world. The town has a population of 656 as of 2013. There are a few unpaved dirt roads in Qaanaaq. Only one road leaves the town – it connects to Qaanaaq Airport. Pickup trucks and SUVs are found in Qaanaaq, but skis, dogsleds and walking are better alternatives for getting around. 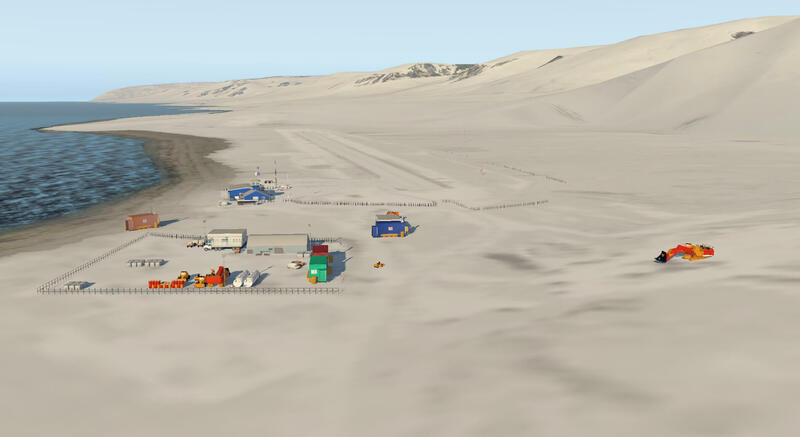 The airport was established in 1991 to serve Qaanaaq and neighbouring communities because Thule Air Base in Pituffik is not open for regular passenger traffic. 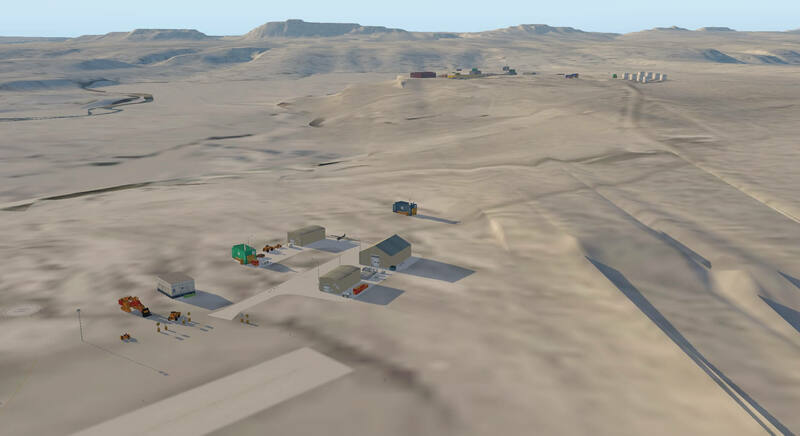 It is the only civilian airport north of Upernavik and is a lifeline for northern Greenland. Fresh food and other consumer products are transported by air. Air Greenland operates government contract flights to villages in the Qaanaaq region. Departure times for these flights are optimised depending on local demand for a given day. The airport is quite refined compared to others visited in the review with a control tower and small terminal and navigation aids of DME/ILS 108.35 MHz, NDB (QQ) 336kHz and waypoint QQ. 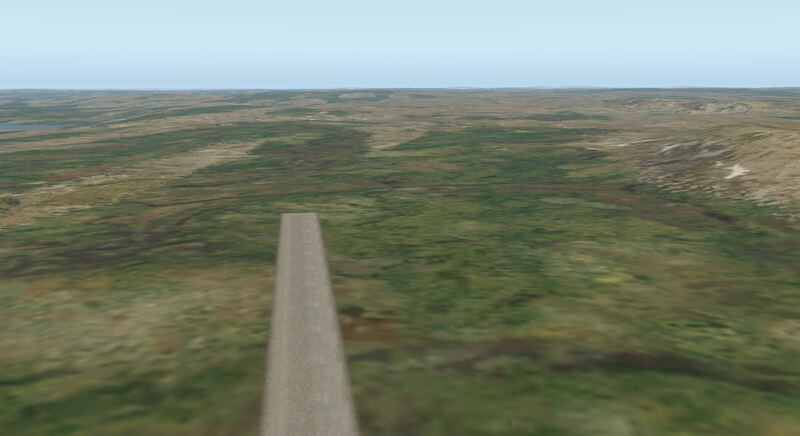 The gravel runway 17/35 is 2953ft (900M) in length with an elevation AMSL of 51ft (16M). 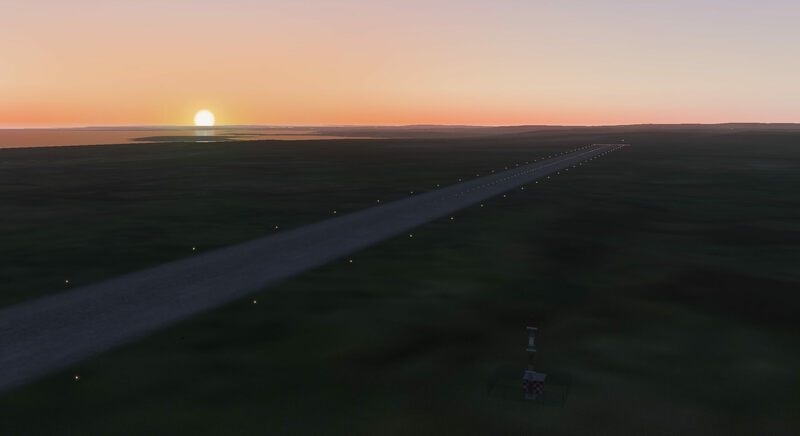 The runway is clearly modelled with lighting along both sides of the runway in lower light. The scenery is set in snow and ice and the lighting strips are modelled as if cleared of snow. The runway area is fenced and lit and support vehicles, navigation aids and buildings are modelled for the airfield. These are modelled in some detail and the colours are bright and clear. They fit well with the surrounding area. Other areas of the airport have tank and storage facilities and maintenance and supply vehicles are also modelled. 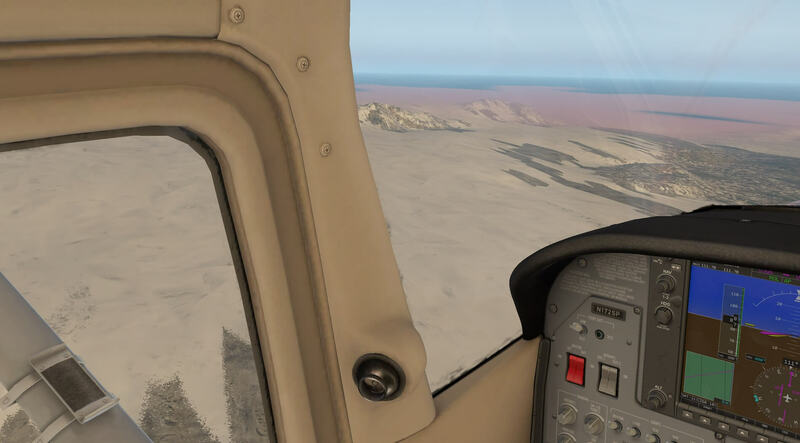 Textures or the snow and nearby water are realistic and again the colours add to the effect. 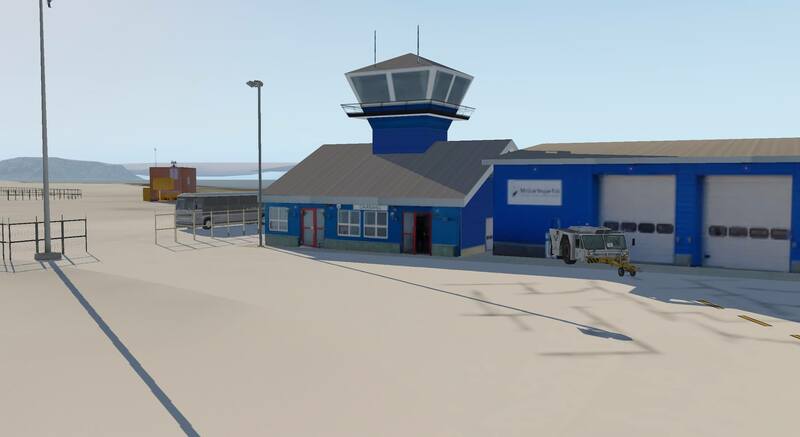 The control tower and buildings are modelled in some detail, with the airport name clear above the entrance, although there is a tow truck parked in a way that disappears in to one wall of the building and would benefit from being re-positioned. The airport has a feel of activity about it due to the items that have been modelled. In low light the airport is lit and the control tower looks very effective. The whole area, including service areas, are all appropriately lit. 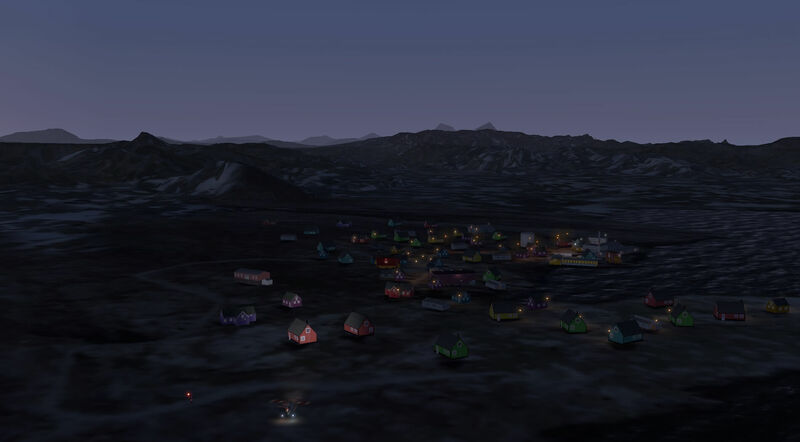 The town of Qaanaaq is also modelled nearby and lights from the town can be seen in the distance. 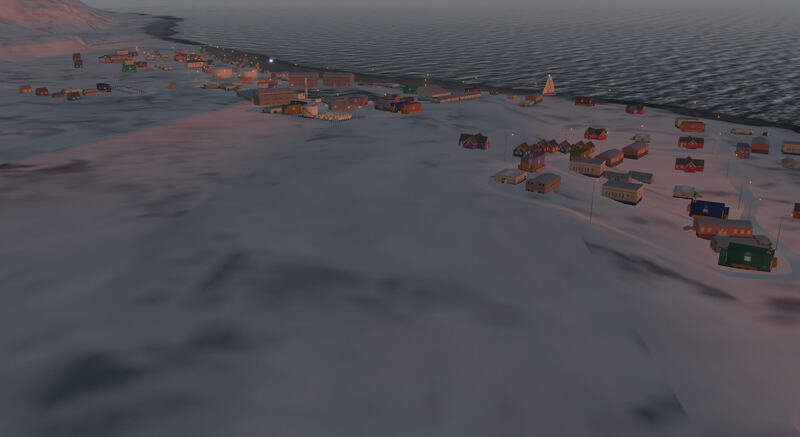 During the daylight the town can be seen more clearly and the single road, mentioned in the description, can be seen under the snow connecting the town and the airport. Light and shadow is used very effectively and the different times of day produce changing lighting effects. 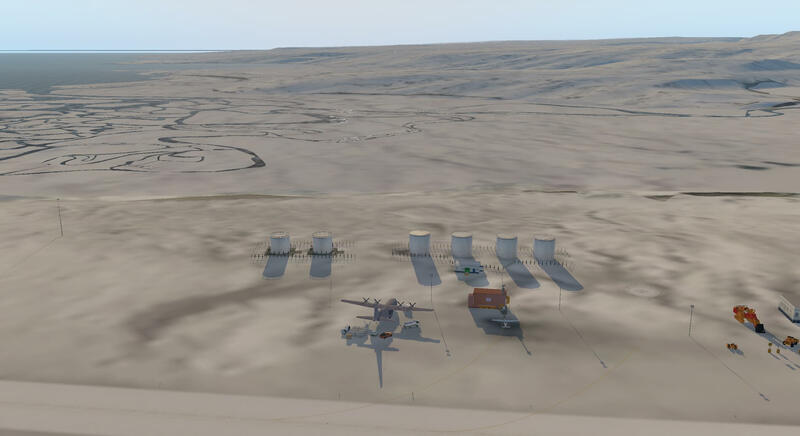 In line with this being one of the busier airfields modelled there is more detail here in terms of human activity and the surrounding landscape maintains its impression. 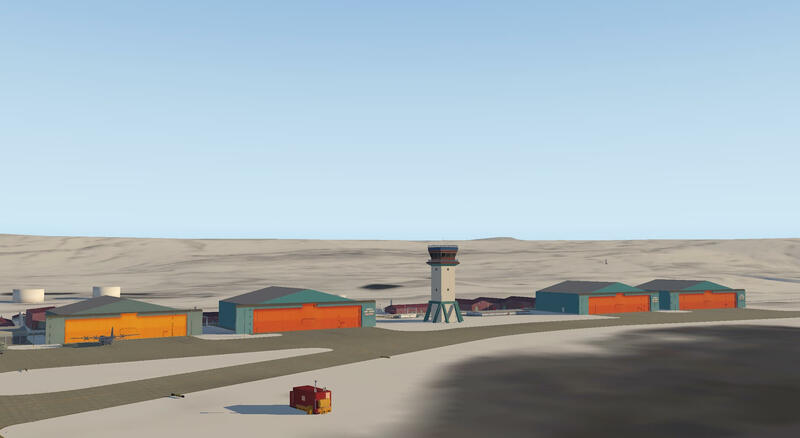 The Qaanaaq airport connects with Thule Air Base and that is the next destination. 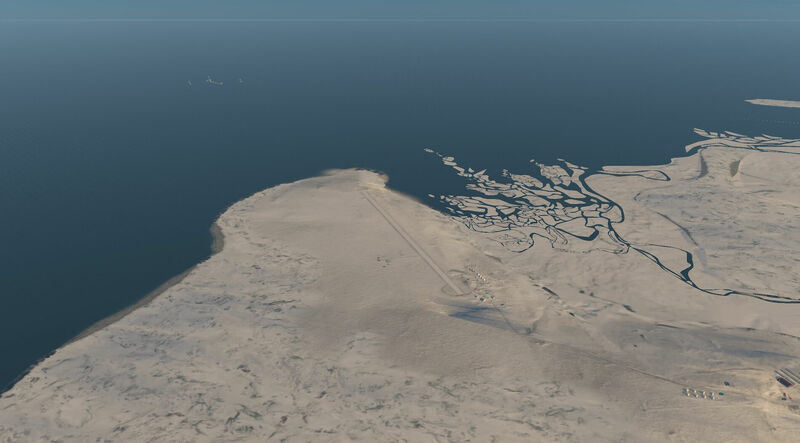 Thule Air Base, or Thule Air Base/Pituffik Airport, ICAO: BGTL is recognised by X-Plane FMS and the two flight planners, and is the United States Air Force’s northernmost base, located 1,207 km (750 mi) north of the Arctic Circle and 1,524 km (947 mi) from the North Pole on the northwest side of the island of Greenland. 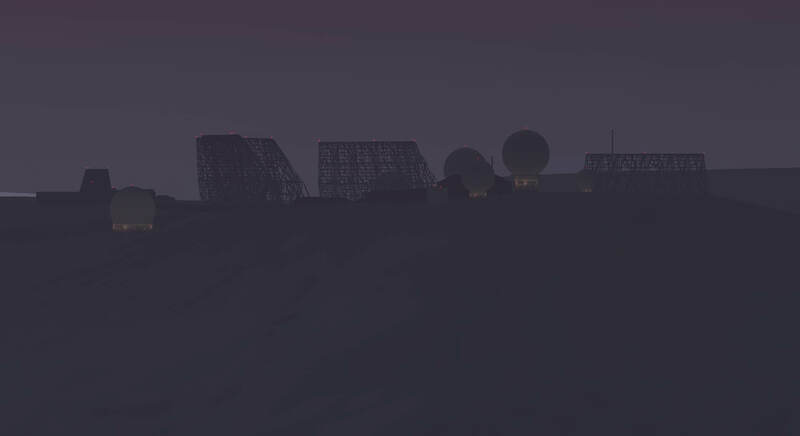 Waypoint ICBRG sits on the airfield and Thule Vortac (THT) is on frequency 111.00MHz. The asphalt runway 08/26 is 9997ft (3047M) in length and has an elevation of 251ft (77M). Thule Air Base is the US Armed Forces’ northernmost installation. It was built in 1943 and is still in use today. The base is home to the 21st Space Wing’s global network of sensors providing missile warning, space surveillance and space control to North American Aerospace Defense Command (NORAD) and Air Force Space Command (AFSPC). 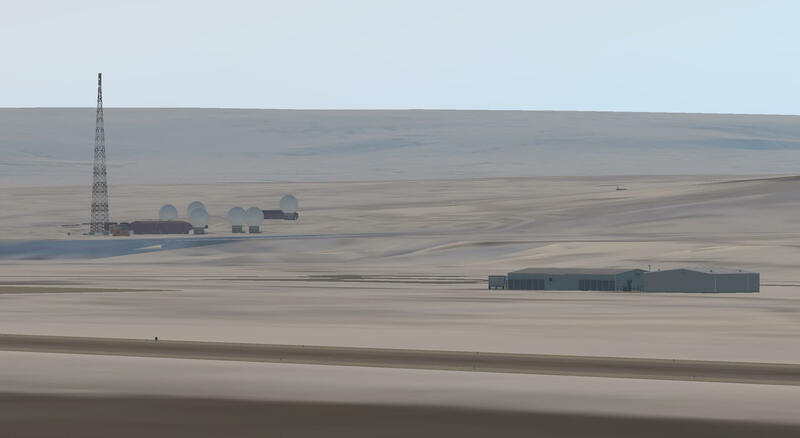 Thule Air Base is also home to the 821st Air Base Group and is responsible for air base support within the Thule Defense Area for the multinational population of “Team Thule”. 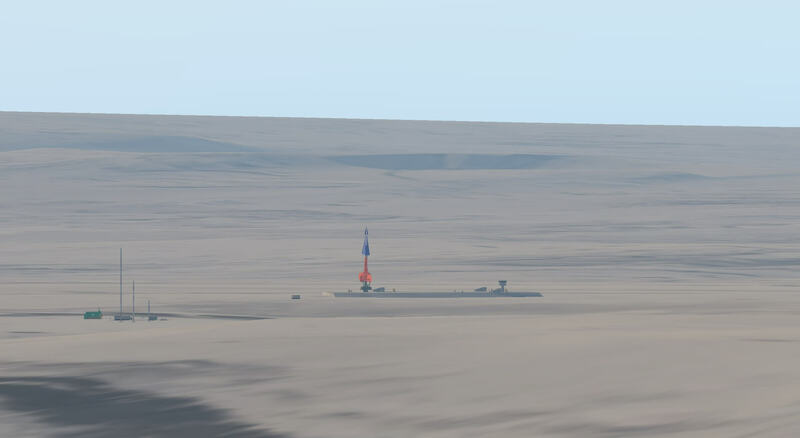 The base hosts the 12th Space Warning Squadron (12 SWS) which operates a Ballistic Missile Early Warning System (BMEWS) designed to detect and track ICBMs launched against North America. Thule is also host to Detachment 1 of the 23rd Space Operations Squadron, part of the 50th Space Wing’s global satellite control network. The airfield’s 10,000-foot (3,000 m) runway handles more than 3,000 US and international flights per year. Finally, Thule is home to the northernmost deep water port in the world and is the only Air Force Base with an assigned tugboat! There is only a brief period each year in the summer when sea ice thins sufficiently to send supply ships to the base. The US sends one heavy supply ship each summer in what is called Operation Pacer Goose. 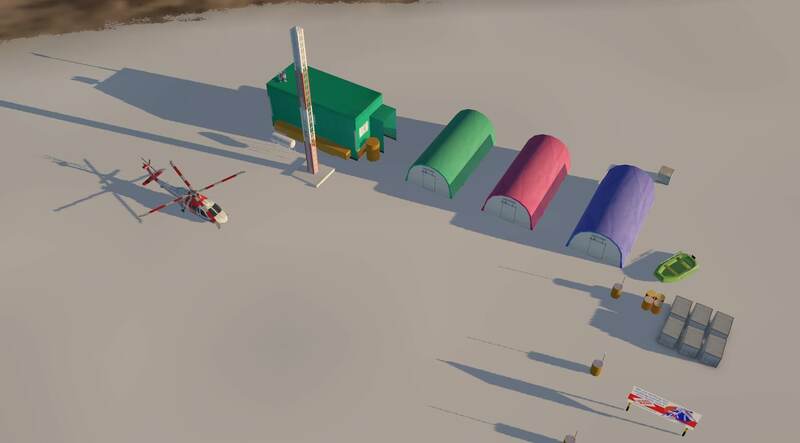 The base is essential in the construction and resupply of High Arctic weather stations, including CFS Alert (Alert Airport) and Station Nord. 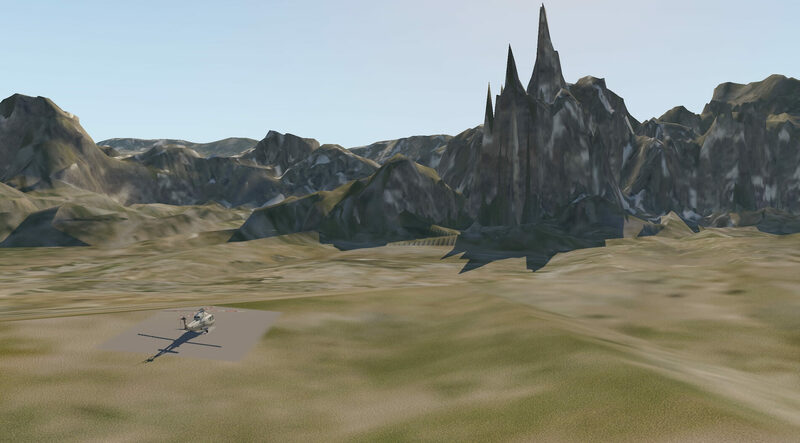 (Both modelled in this scenery package). The air base is modelled extensively with numerous different areas and facilities in line with the agencies and squadrons using Thule. Viewing the base shows hangars, parked aircraft, accommodation, radar, fuel tanks and navigational aids. All are modelled in detail and colours are bright and vivid and in keeping with the base. The control tower is also modelled in detail. Looking further afield the jetty for the tug boat and support ships is present with ships alongside. Runways and taxi ways are modelled with realistic markings and signage and the textures and colours show this is a large asphalt facility. The specialist nature of the base is illustrated by the various sub sites around the airfield area with various installations in keeping with the uses the base is put to. I have never visited the base but the additional equipment modelled is what would be expected at a base of this nature. At low light the lighting across the base is very impressive with runways, taxi-ways, buildings, vehicles and facilities with their own lights. 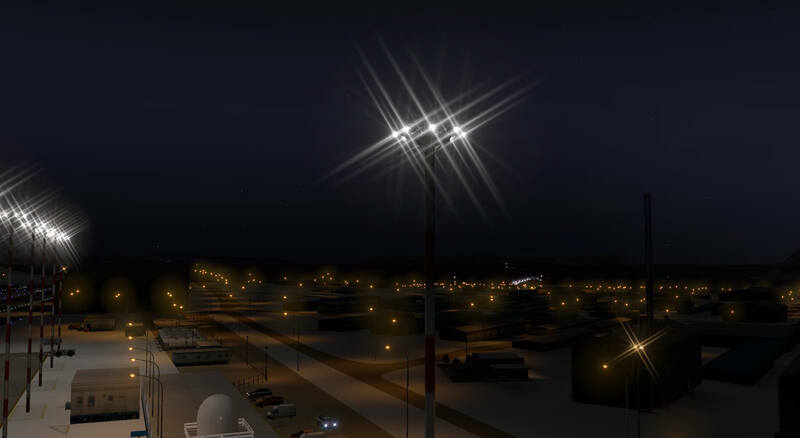 The air base is modelled to high standard with considerable attention to detail and given that the developers stated that they would only model for flight this is a venue that has so much going on. It is a real contrast to the remote locations also modelled and these two extremes compliment each other in that the smaller locations seem even more isolated given the industry attached to this base and Thule appears so much more civilised because of the modelling of the remote gravel strips. 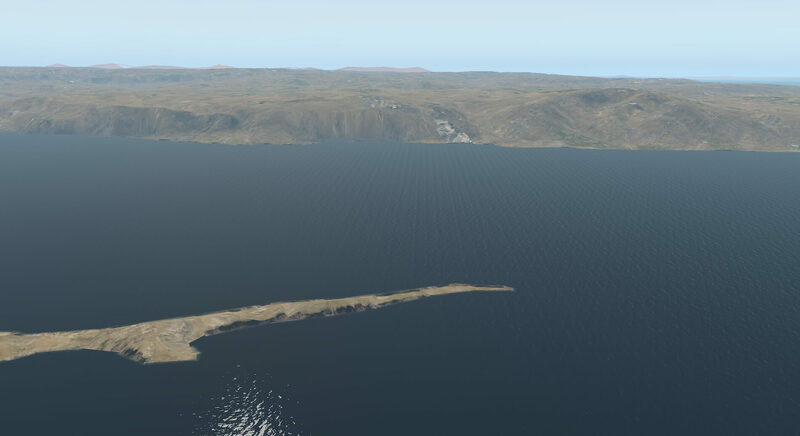 There next follows a series of helipads beginning with Moriusaq Heliport, ICAO BGMO not recognised by X-Plane FMS or the flight planners. 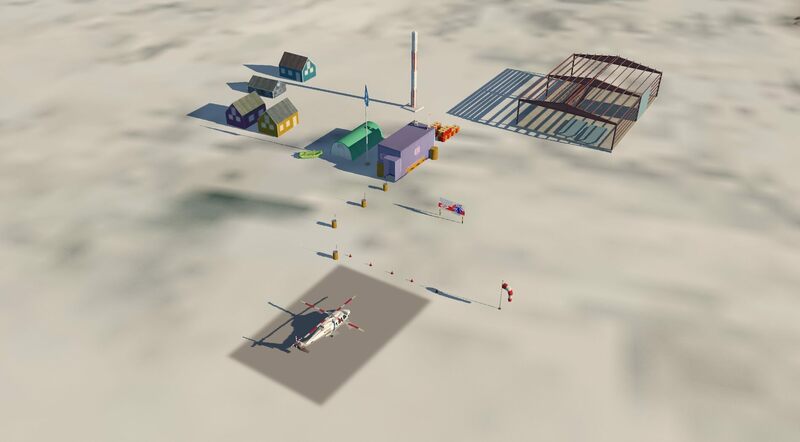 The heliport is in Moriusaq, a village in the Qaasuitsup municipality in northern Greenland approximately 26.1 mi (42km) to the northwest of the Thule Air Base and 51.6 mi (83km) to the southwest of Qaanaaq. The heliport is considered a helistop, and was served by Air Greenland as part of a government contract. Moriusaq was established in 1963, and it reached a population peak in 1980 when the census reported 80 inhabitants. In the subsequent years nearly all families moved away, particularly to Qaanaaq where the infrastructure is better and services are thus more readily available. In September 2010, the last occupants of Moriusaq moved to Qaanaaq and the settlement was closed down. On December 31, 2010, its post office officially closed. Statistics Greenland recorded the population in 2012 as 0 and they now list Moriusaq as a closed settlement. This may well account for the fact that the ICAO code is no longer recognised. The model displays this more as a helicopter facility than a landing area close to a village. Given the background explained above this is probably true to life. The venue consists of several supply huts, supply crates and an inflatable boat. There is what appears to be a generator hut and a lighting pylon. Light and shadow work well and the reflections on the water add to realism. The surface at the base is covered in snow but the helipad sits on a small promontory and the land close to the surrounding water shows signs of thaw. The colours are bright and vivid and the detail provided is convincing. A wind sock assists in determining wind strength and direction. 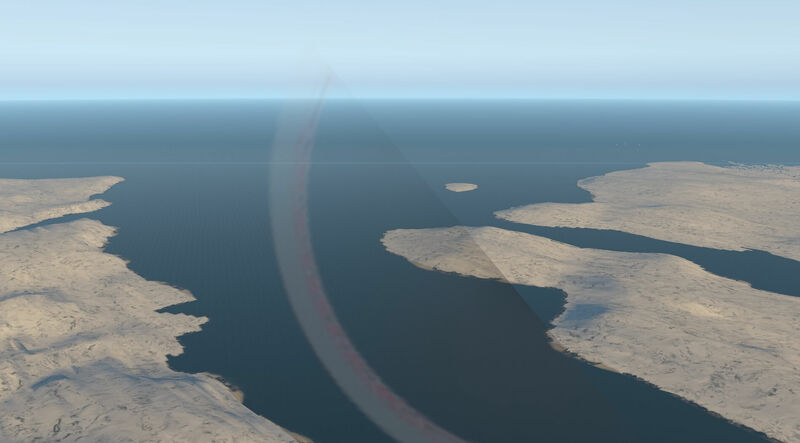 The base is modelled with no communication or navigation aids but way point D005V is set 3.7nm to the South East and Thule Air Base is relatively close by to assist with finding the helipad. In dusk and darkness the lighting for a small facility is well modelled and illuminates the area very well. 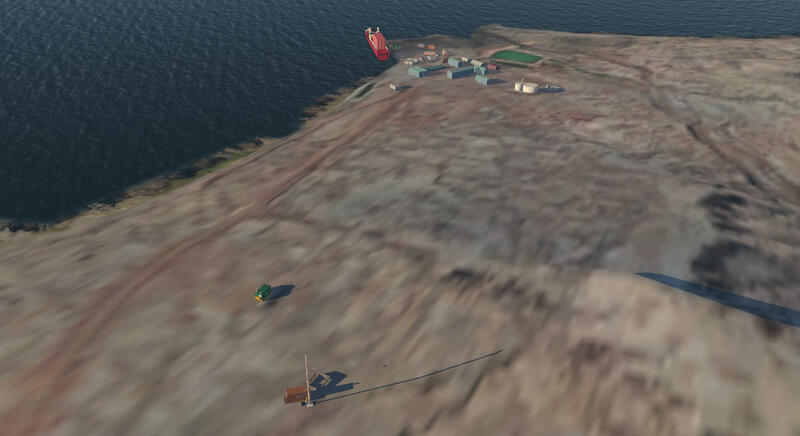 The second helipad of this series is Savigsivik Heliport, ICAO BGSV not recognised by X-Plane FMS nor the two flight planners. 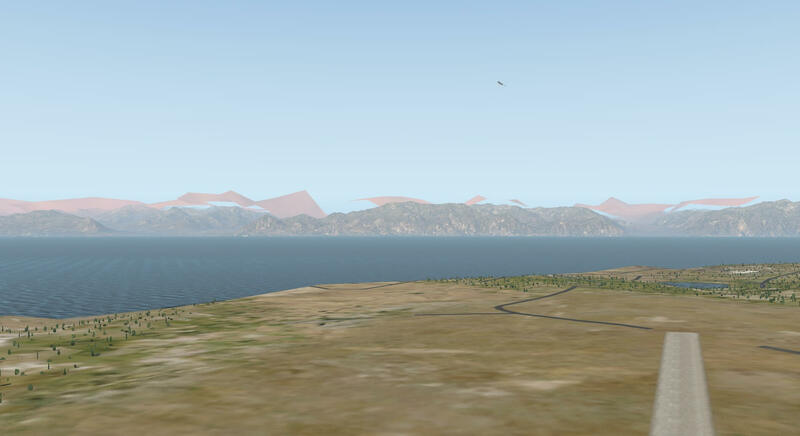 Whilst the name appears as above in the locations menu research on Wikipedia shows it is spelt Savissivik and confirms the ICAO code provided by the scenery package. 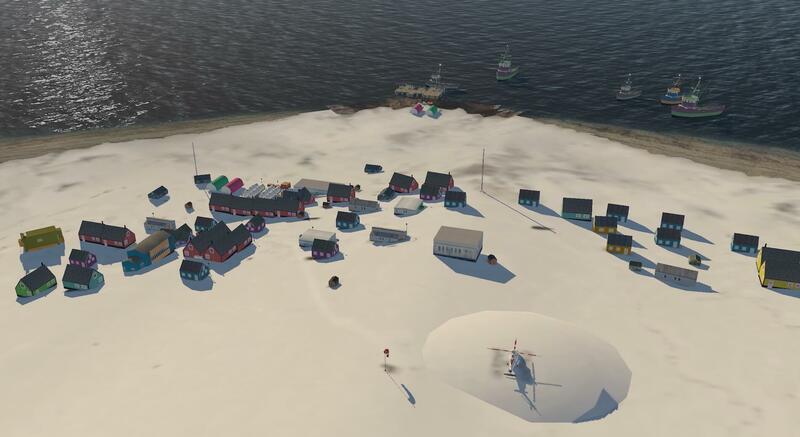 The heliport is in Savissivik, a village on Meteorite Island, off the shores of the northern end of Melville Bay in the Qaasuitsup municipality, northern Greenland. The settlement had 66 inhabitants in 2010. The heliport is considered a helistop, and is served by Air Greenland as part of a government contract. 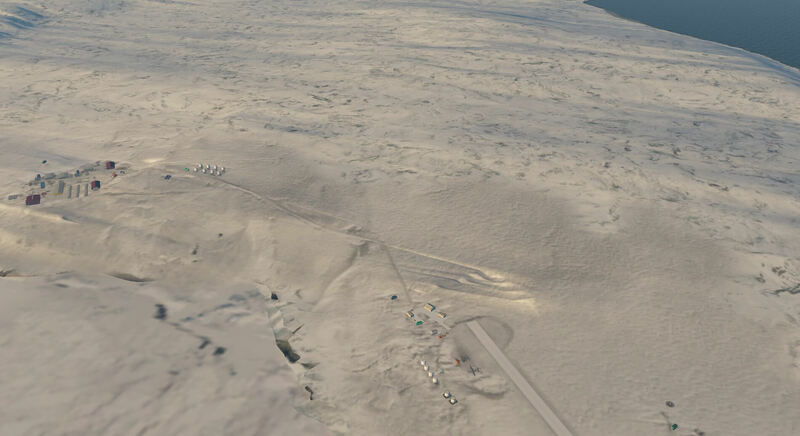 Air Greenland operates settlement flights to Qaanaaq Airport via Thule Air Base. The twice-weekly flights are subsidised by the Government of Greenland. This facility is modelled on a snowy landscape next to the sea. There are no buildings, roads or other infrastructure modelled. The base has no navigational aids or communication. One of the more basic facilities modelled surrounded by impressive scenery. 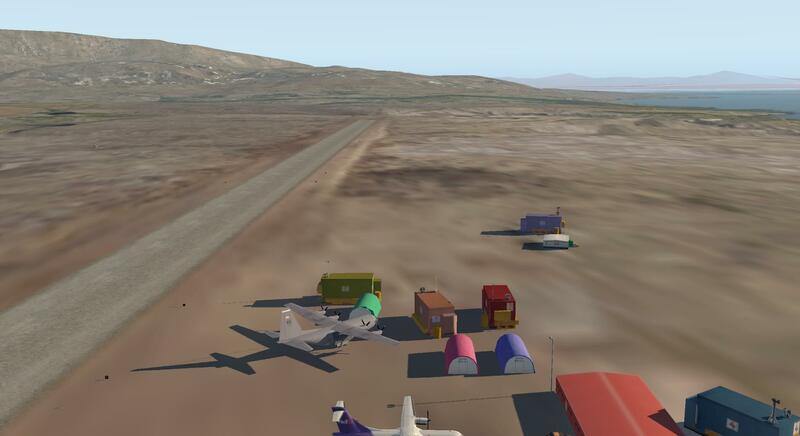 Moving on in the tour of bases I arrive at Kullorssuaq Heliport, ICAO BGKQ, not recognised by X-Plane FMS nor the two flight planners. Research on Wikipedia shows the name as Kullorsuaq and confirms the ICAO code. This is a heliport in Kullorsuaq, a village in the Upernavik Archipelago of Avannaata municipality in northwestern Greenland. 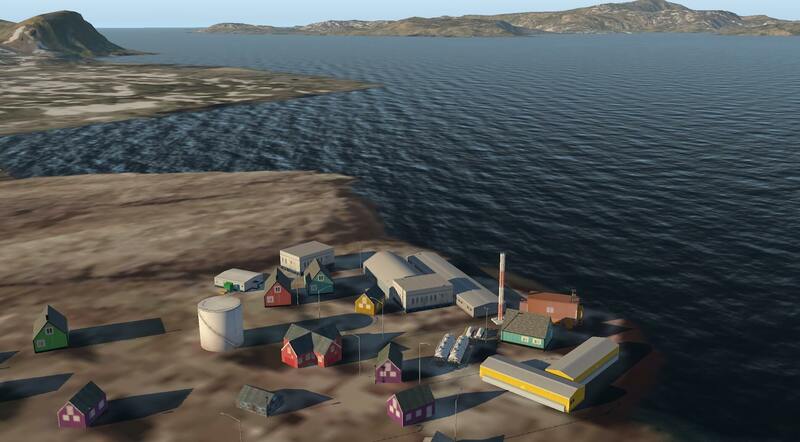 Kullorsuaq is located on an island of the same name at the southern end of Melville Bay. The island is the northernmost part of Upernavik Archipelago. The heliport is considered a helistop, and is served by Air Greenland as part of a government contract. 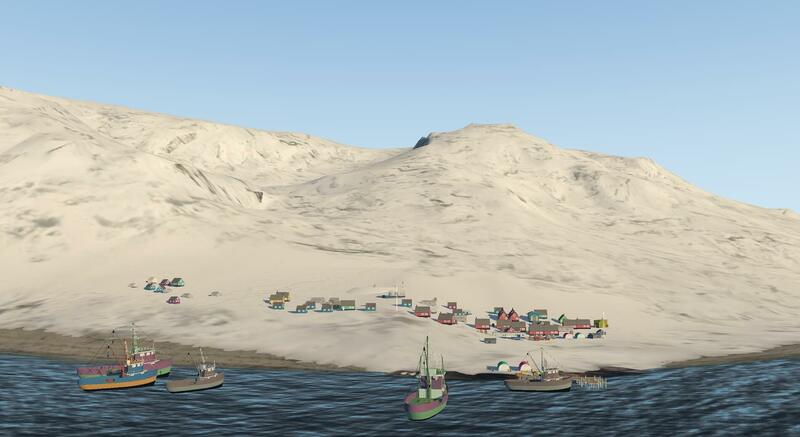 With 448 inhabitants (2013), Kullorsuaq is the largest settlement in the Upernavik Archipelago outside of Upernavik. 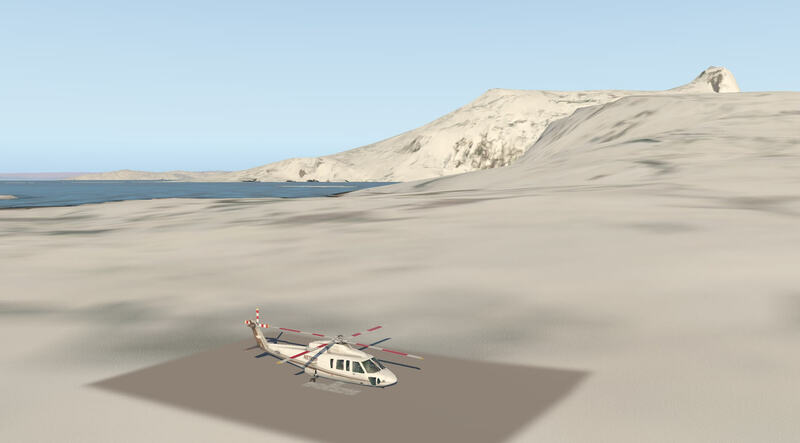 The base is modelled as a simple helipad surrounded by a snowy landscape. There are no facilities or infrastructure and the village is not modelled. There are no navigation aids or lighting present. The surrounding scenery is impressive with snow, ice and ice bergs presented. The light works well across the scenery and the water textures and colours are convincing. 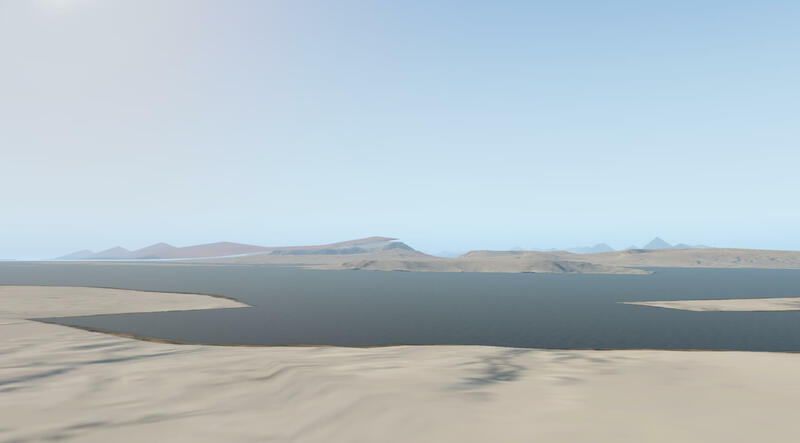 The contours of the land are varied and realistic. 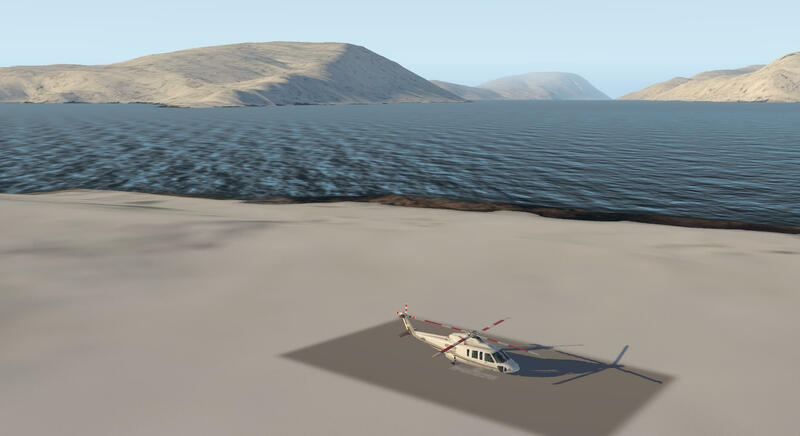 The next helipad is Nuussuaq Heliport, ICAO BGNU not recognised by X-Plane FMS nor the two flight planners. 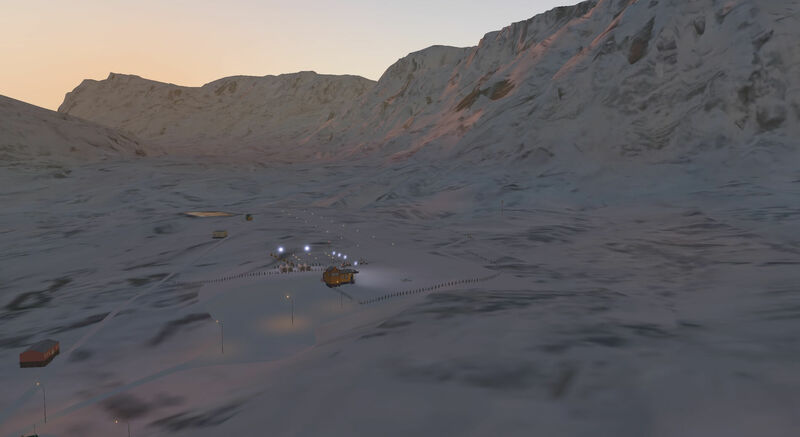 The heliport is in Nuussuaq, a village in the Upernavik Archipelago of Qaasuitsup municipality in northwestern Greenland. It is the only mainland settlement in the Upernavik Archipelago, located near the western tip of the Nuussuaq Peninsula, on the northern coast of Sugar Loaf Bay, an indentation of Baffin Bay. The settlement was founded in 1923 as a trading station, growing in size during the post-war consolidation phase, when hunters from several small villages in the region of neighbouring Inussulik Bay, Sugar Loaf Bay, and Tasiusaq Bay moved into the larger settlements such as Nuussuaq and Kullorsuaq further north in Melville Bay. Today Nuussuaq remains one of the most traditional hunting and fishing villages in Greenland, with a stable population and in 2010, Nuussuaq had 204 inhabitants. The population of the settlement has slowly increased over the last two decades. Air Greenland serves the village as part of government contract, with twice-weekly helicopter flights to Kullorsuaq and Upernavik. The heliport is modelled as a helicopter facility with some dwelling houses. There is a storage area and a generator house along with a partially constructed store shed. The base is set in snow with impressive surrounding scenery and water. The colours of the buildings are bright and clear and during the hours of darkness the site has its own lighting. 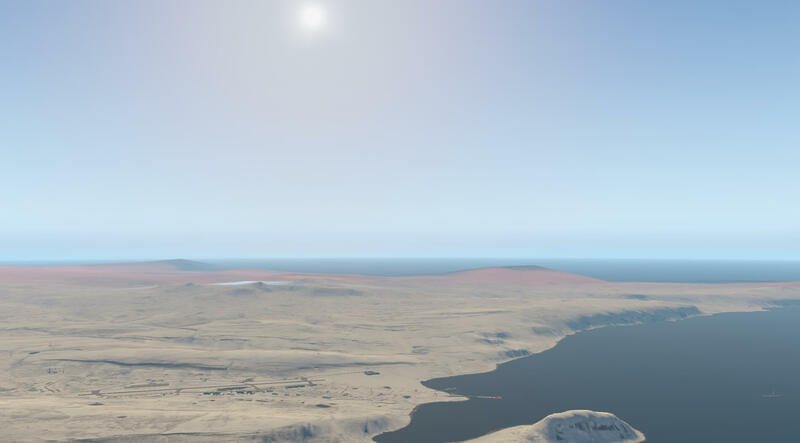 There are no navigation aids or communications at the facility and the vast expanse of the surroundings illustrates the isolation and remoteness of the settlements and the importance of the helicopter service. Colours and textures in the surrounding scenery are very realistic. 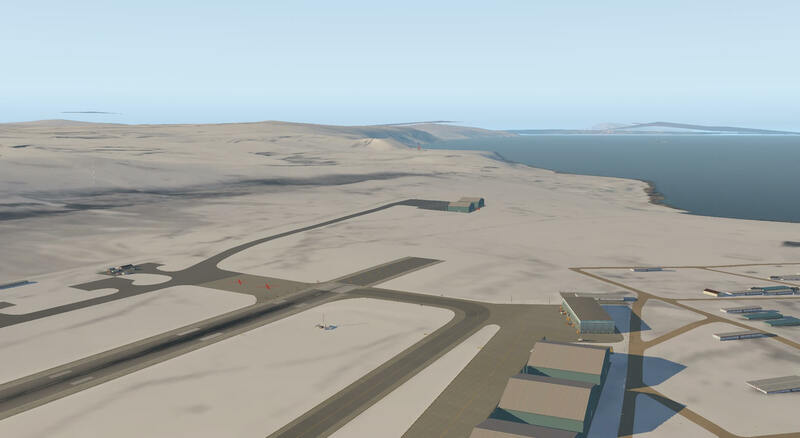 Tasiusaq Heliport is the next visit with an ICAO of BGTQ in the scenery package but given as BGTA in Wikipedia neither of which is recognised by X-Plane FMS or the two flight planners. This is another helistop forming part of the government contract, fulfilled by Air Greenland, to supply local villages. 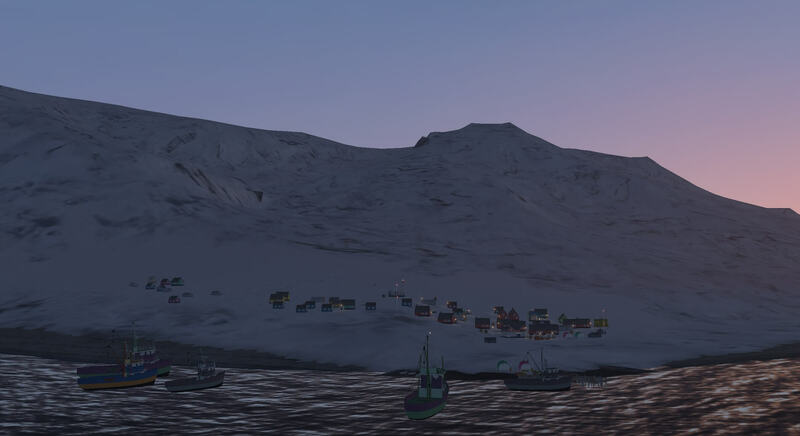 Tasiusaq is located within Upernavik Archipelago, a vast archipelago of small islands on the coast of northeastern Baffin Bay and had a population of 248 in 2010 with signs of continued population growth. It should be noted that there is another village of the same name in southern Greenland. The helipad is modelled with no buildings or infrastructure. It has no lighting, communications or navigation aids. 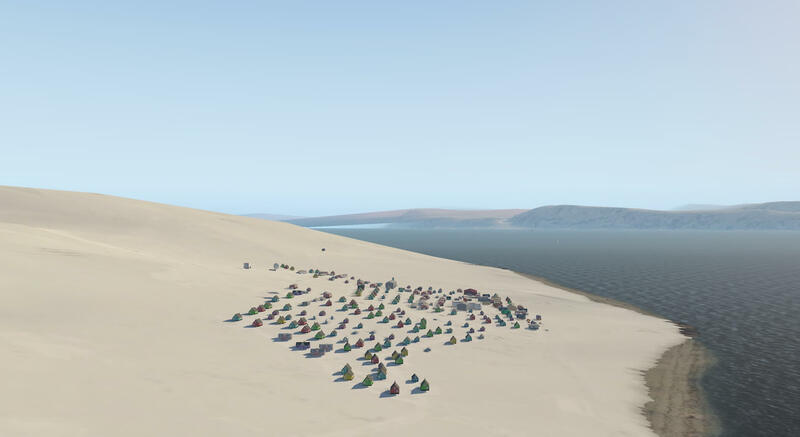 The developers have used the opportunity to present the scenery with no snow or ice and after the snow and ice modelled in previous location it looks very green and the comparative warmth can almost be experienced. Light and shadow work well and actually give the feeling that it is warmer here than other places. Whilst the scenery does not include infrastructure the hills and cliffs surrounding the location are very impressive and more rocky in appearance than those elsewhere. 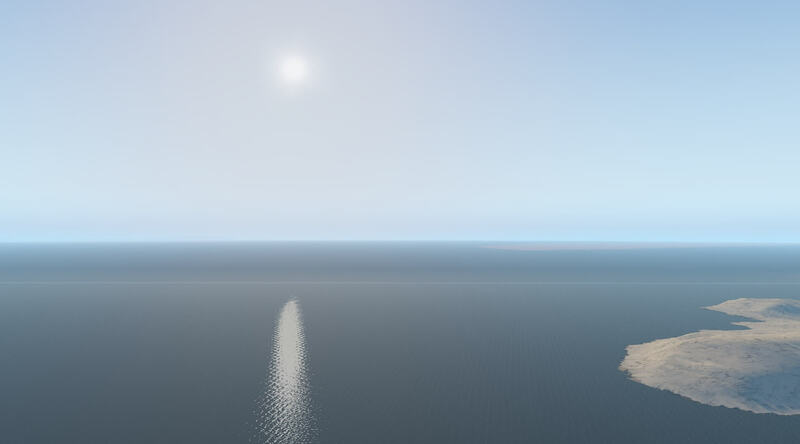 The water texture is also calmer giving the impression of a more inviting environment. Whilst this helipad is not full of detail it certainly compliments the other venues. 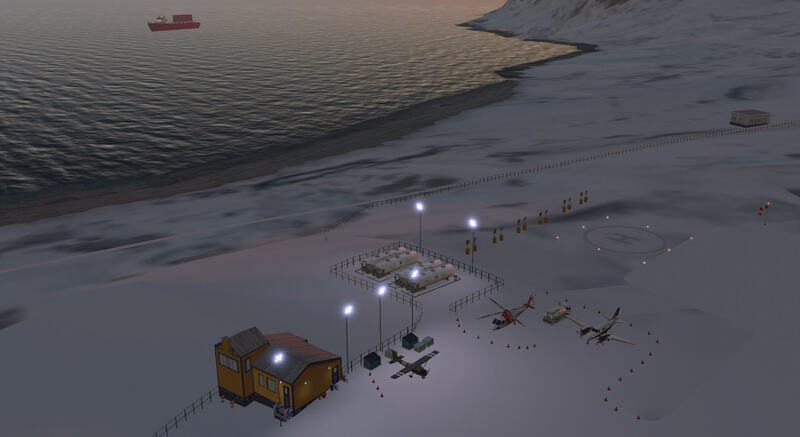 The last heliport on this trip down the west coast of Greenland is Innaarsuit Heliport, ICAO BGIN which is not recognised by X-Plane FMS or the two flight planners and is another helistop under the government contract with Air Greenland. Innaarsuit is an island settlement in the Avannaata municipality in northwestern Greenland. Located on an island of the same name, the settlement had 161 inhabitants in 2010. The modelling illustrates slightly warmer climes with patches of snow and ice and rocky barren ground. The settlement itself is modelled with a large variety of buildings including dwellings, storage facilities and industrial structures. The settlement has some road infrastructure. The buildings appear realistic and colours are vivid and varied. 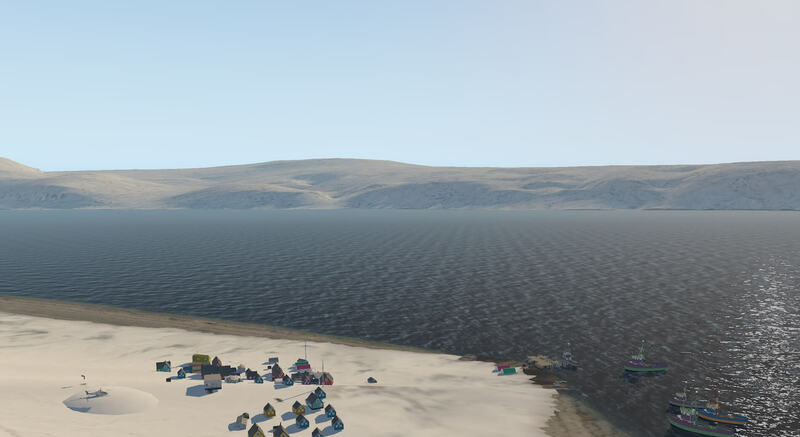 The water texture implies better weather in these parts and the hills around the settlement add authenticity and atmosphere. Light and shadow work well to continue giving depth to the scenery. The helipad itself is an open area next to the settlement with a windsock and service road. 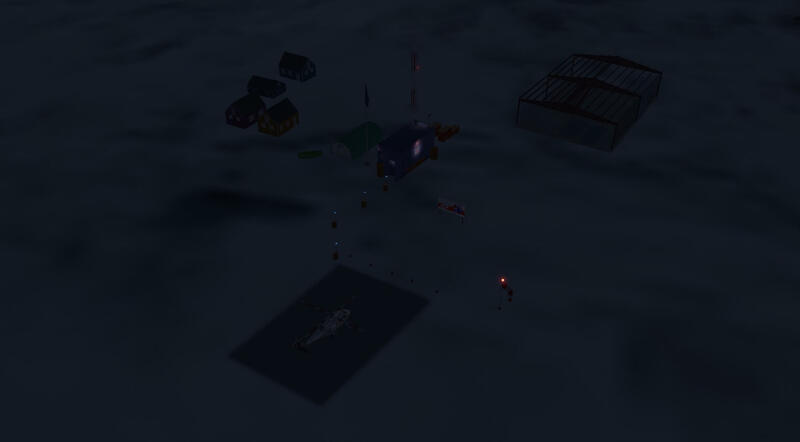 At night the settlement is lit but the helipad has no lighting of its own other than a warning light on the windsock. 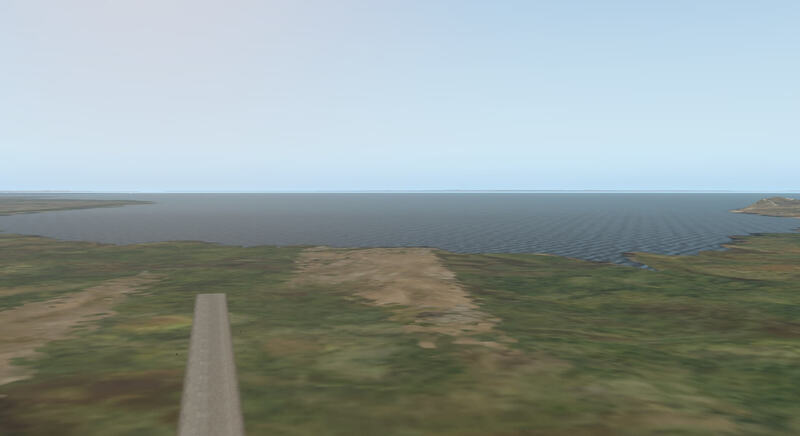 There are no navigational aids at the helipad though the site is again alongside the water and on a flat area of land with long approaches over the sea so coupled with the settlement this should help VFR flight. It was my intention to move on North Grip Landing Strip. 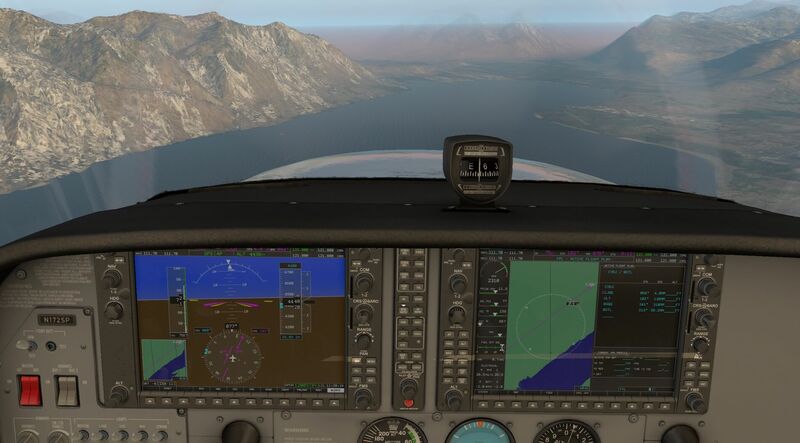 The developers have given this a code of GRIP but despite using every variation of the name and the code the location box in flight configuration in X-Plane could not find it nor was the ICAO code recognised by X-Plane FMS nor the two flight planners. I checked the sales information on the X-Plane store and North Grip is shown on the map and mentioned in the supporting text. 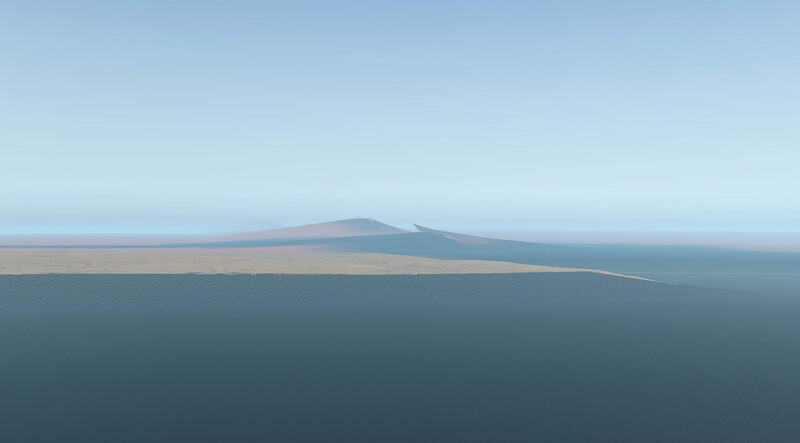 On checking the downloaded custom scenery folder there was a file for every base except for North Grip so I assume this has not formed part of the download. As mentioned earlier I completed a second download and found it to be missing from this also. 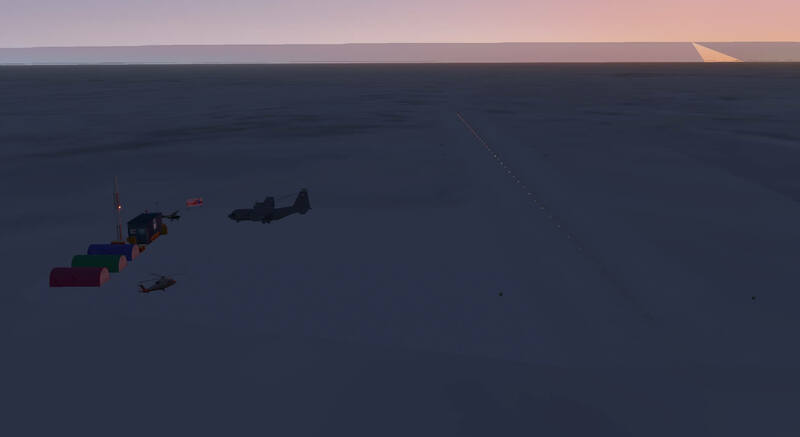 I next moved on to Danmarkshavn Landing Strip. The ICAO given in the download, information and in the Location selection box in flight configuration is BGHD but in information on the internet it is given as BGDH. Sea that non-icebreaking vessels can pass through. Therefore, it is resupplied by cargo ship in August every other year; thus the population increases somewhat for a brief time every other August. The ice situation varies, and some years it is not possible to reach the station, other years it’s ice free further north. It is operated by TELE-POST Greenland, a telecommunications company. 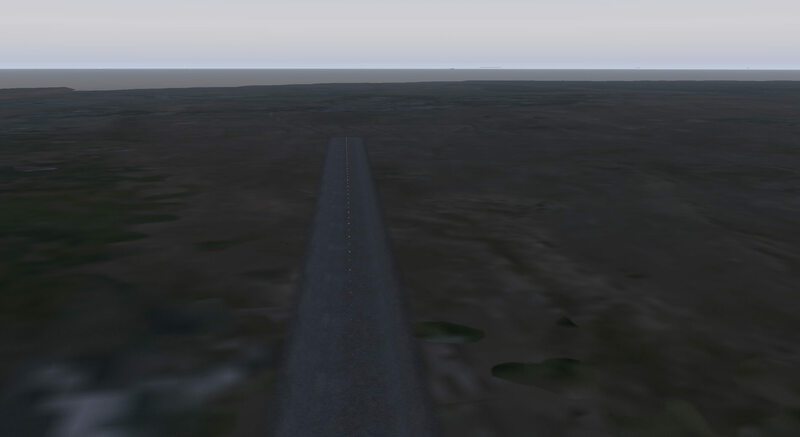 Information on the internet simply states that Danmarkshavn has a short airstrip with no further details available. 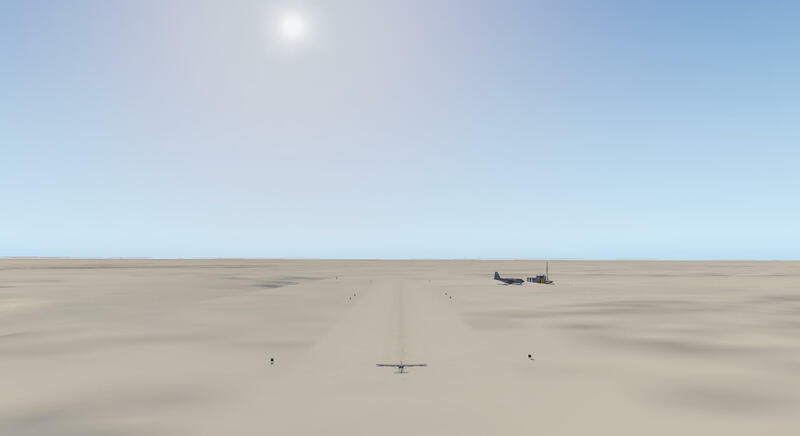 The airfield is modelled as a gravel strip with no other buildings or infrastructure present. The strip is set in a basin of snow covered hills alongside the Greenland Sea. Whilst no elevation is given in any information I can find it appears to be only a few feet above AMSL. 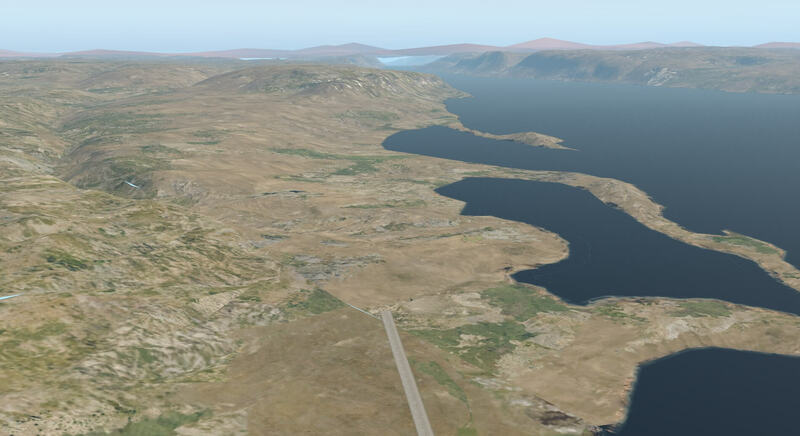 Information provided via the M map function in X-Plane gives the runways as 17/35. There are no navigational aids although beyond daylight the strip has lights down the centre. 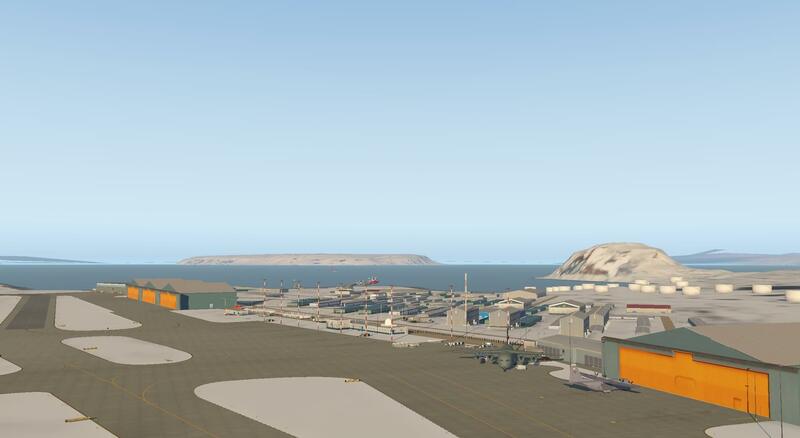 This is another remote location but surrounded by impressive scenery and giving the user the opportunity to fly in the south east part of Greenland. 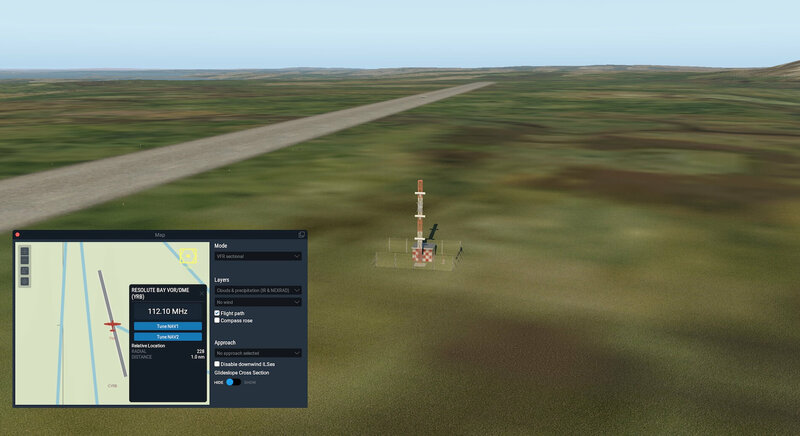 The final destination of the tour is Station Nord Landing Strip ICAO on the supporting map on the store page is BGMI but in the location section of the Flight Configuration page it is BGNO. 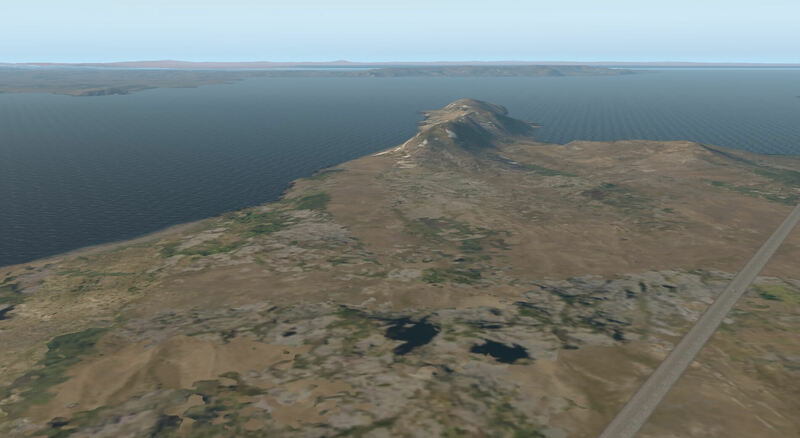 This is recognised by X-Plane FMS and Goodway but not by Little Navmap. Station Nord is a military and scientific station in northeastern Greenland 1700 km north of the Arctic Circle at 81°43’N, 17°47’W. 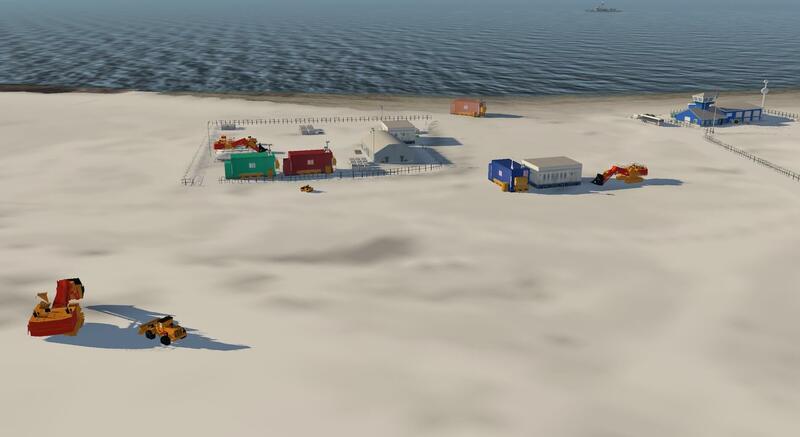 It is about 924 km (574 mi) from the geographic North Pole, on Ingeborg Peninsula in northern Kronprins Christian Land, making it the second northernmost permanent settlement. The Danish Defense Command base is staffed by five Danish NCOs on a 26-month tour of duty; accommodation is also available for over twenty scientists and other personnel during the summer months. The station has about 35 buildings. It is not accessible by ship; ice conditions would permit a passage only every five to ten years. Winter darkness extends from 15 November to 28 January. Nord was initially established as a base for the potential recovery of military aircraft during the cold war and also as a weather station.It was closed once it was decided it was not an essential base and US financial and logistics support stopped. Nord was reopened in August 1975 by the Danish Defense Command (DDC) as a military base for a trial period. The station was recognised as important as a gateway to otherwise inaccessible parts of northern Greenland and was made permanent. Today the operation of the station is under the responsibility of the Joint Arctic Command, but is manned on a daily basis with personnel from the three services and five volunteers are stationed there 26 months at a time with a 3–5 weeks leave period in the middle. The landing strip is kept open for approximately 300 days a year and is maintained with two large snow blowers and two snow ploughs. 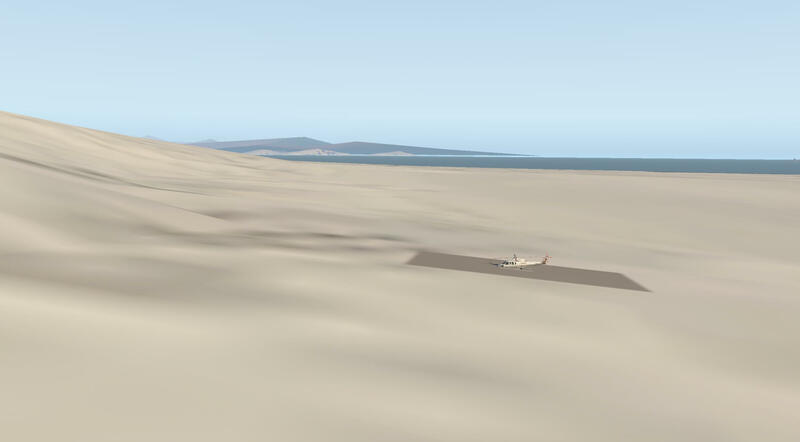 The M map function in X_plane give the runways as 17/35. The airfield has DME-ILS (NOR) frequency 111.70MHz, Station Nord NDB (NO) frequency 404KHz and waypoint NOMPT 1nm away. 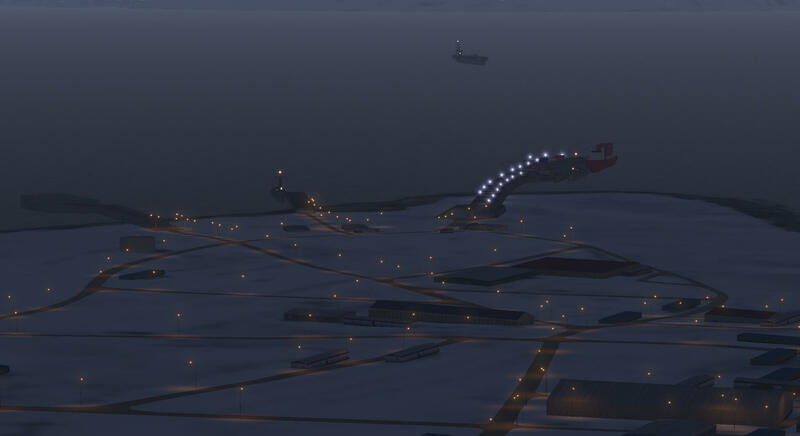 The scenery here is modelled in a snowy landscape and the runway can be seen under snow. The surrounding area contrasts considerably with other parts of the scenery as it is flat with visibility extended in all directions. 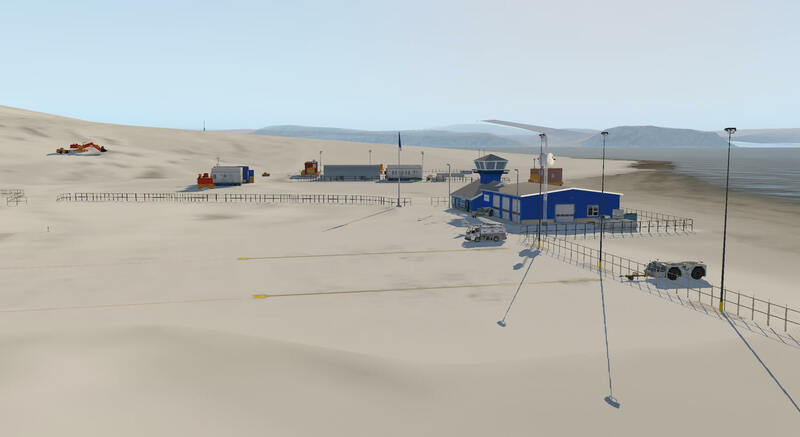 The Nord station is modelled alongside the airstrip. The buildings, both residential and utilitarian, are appropriate for the purpose of the station and road ways thought the base are marked with oil drums. 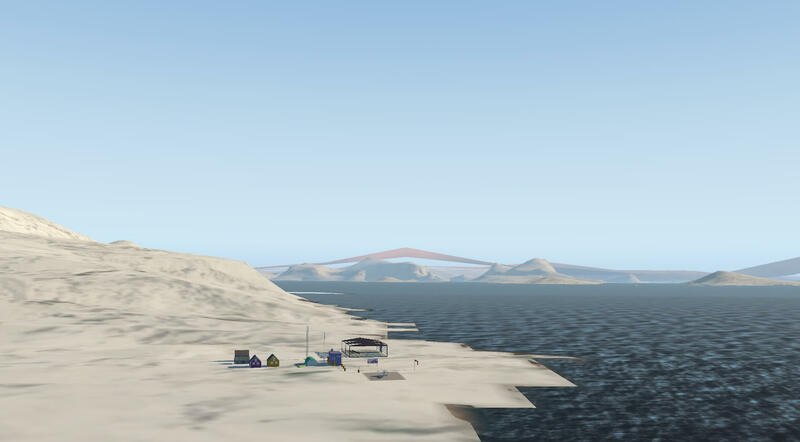 The textures used for the snow are realistic and contrast with the water nearby where the ice is breaking close to shore. The scenery emphasises the remoteness of Nord and how essential air support is to its functions. In low light the settlement is lit appropriately including buildings and radio masts. The run way itself is not lit. In accordance with its position daylight never really disappears in the summer months and winter operations will be severely limited. 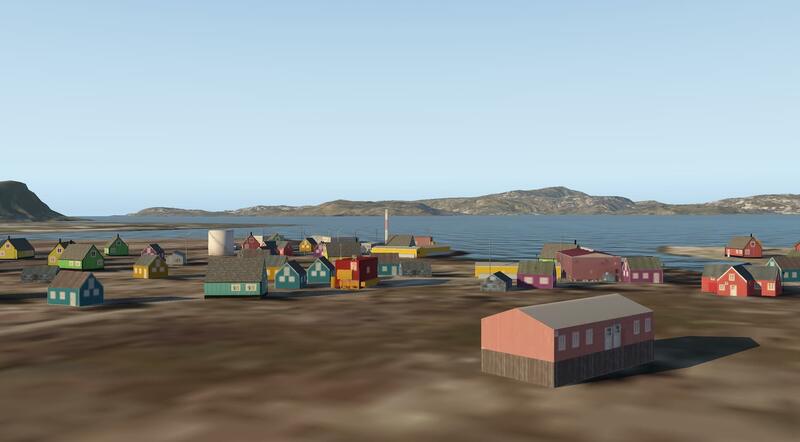 A great addition to the scenery package which is modelled in accordance with the uses to which Station Nord put and allows flight in the north east area of Greenland. 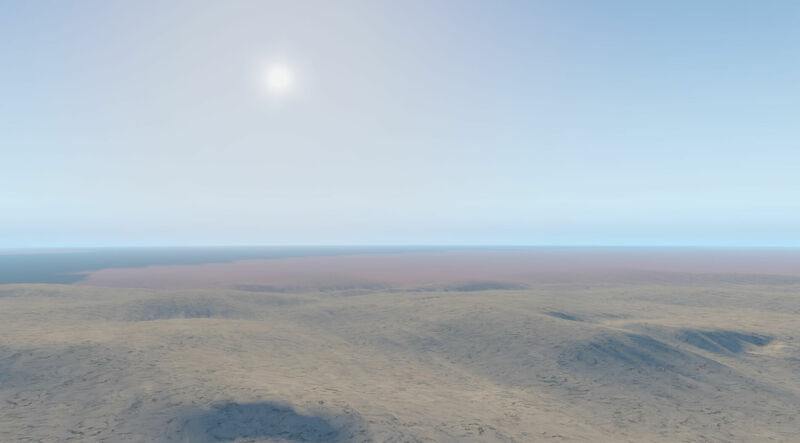 The developers have stated in their guidance notes that this scenery is designed for flight and not just to be viewed from the ground. It is right then that this review looks at the scenery from that perspective as well as the detail of the airfields provided. 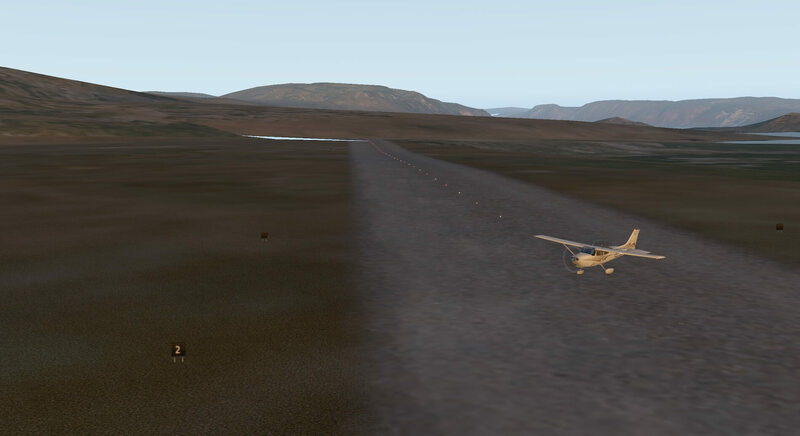 I started my flight at Eureka airport and headed to Tanquary Fiord. The scenery maintained its integrity throughout. I have never been to this area but the whole landscape is convincing and colours and textures add to the realism. 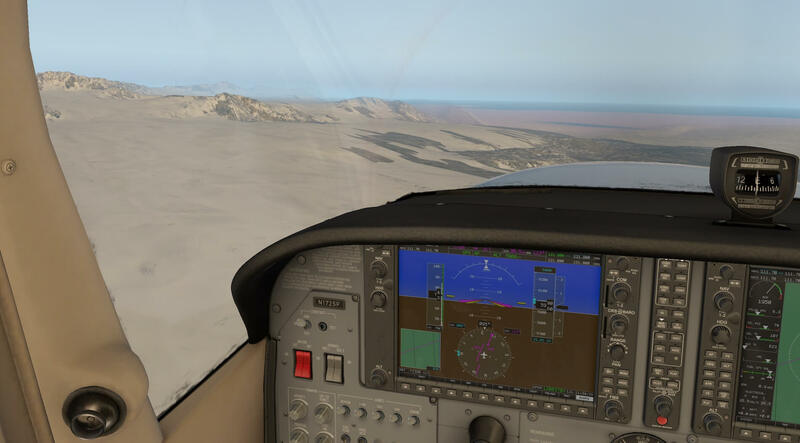 Mountain ranges move below the plane and the varying colours produce a real 3D effect with patches of snow and ice ensuring the user remembers the area in which the flight is taking place in a less than welcoming environment. Water appeared below with realistic colours and textures. Sometimes strange triangles appeared in the distance which, at first, appeared like incomplete scenery however closer examination showed the triangle is the dark side of a mountain peak with snow on the less visible slopes. My waypoint of Tanquary Fiord appeared ahead as expected. 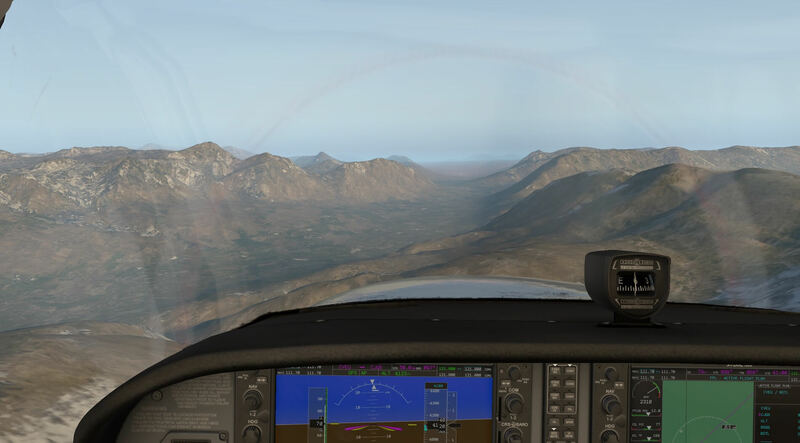 Due to the mountain ranges I had viewed the scenery on this part of the route from between 2500ft and 5000ft AMSL. Overflying Tanquary Fiord I headed further north to Alert Airport. 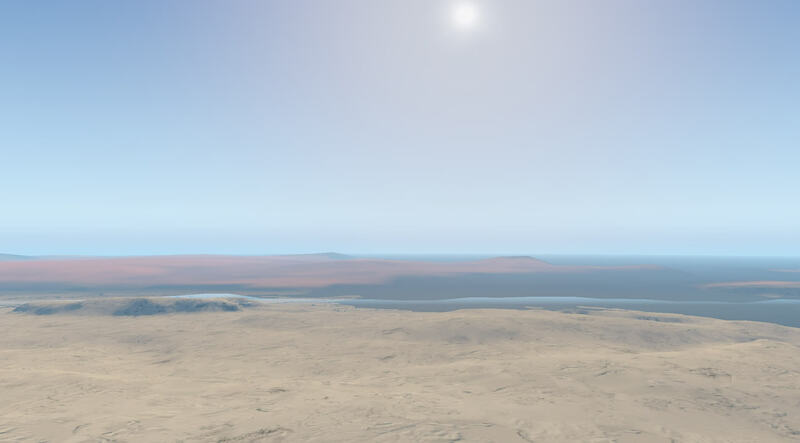 I spent some of the flight at over 8000ft to find the scenery maintained its integrity and realism from varying altitudes and I descended as I neared the coastline. As expected heading this far north the scenery carried more ice and snow. 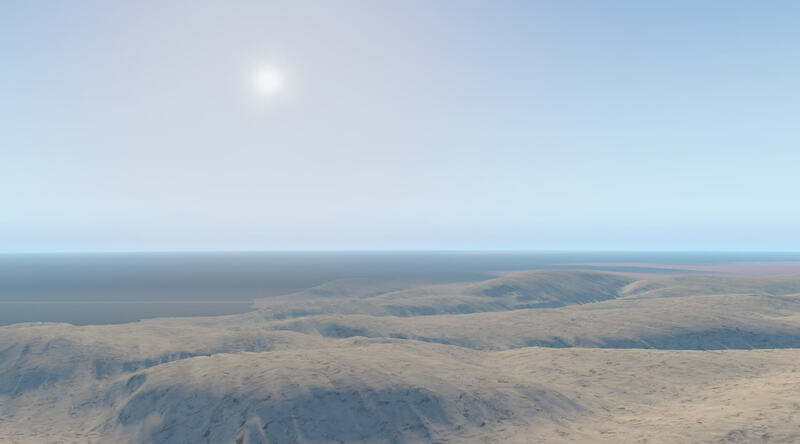 When I started the review I thought there would be large areas that were just white but the developers have worked hard to maintain realism and add texture and terrain which helps keep a visual perspective on height and direction. Reflections of light off water and snow also vary with time of day and the suns direction relative to the aircraft. Reducing altitude near the coast the snow and ice created a crisp and clear contrast with the sea and all the scenery worked well together. Approaching Alert Airport I easily recognised the airstrip and additional features I had viewed when taking a closer look at the facility earlier in the review. 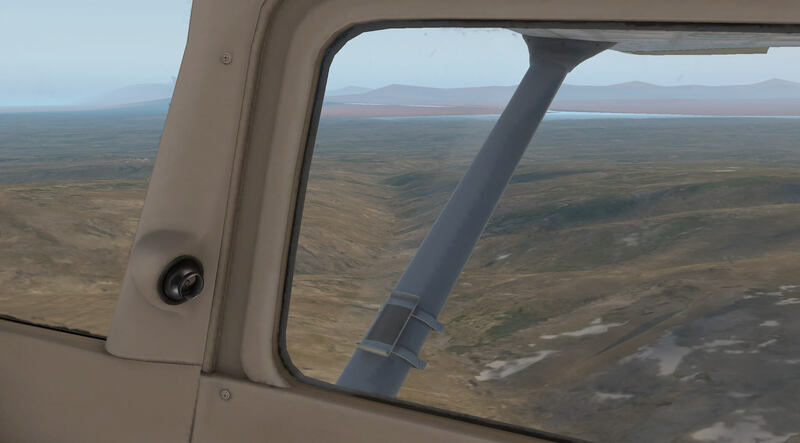 I overflew Alert and continued across the barren wilderness of northern Canada with the intent of crossing the coast whilst heading south to Qaanaaq Airport in Greenland. The scenery of Canada remained convincing all the way to the coast which I crossed at around 4500ft. The route followed the coast line for a while before a water crossing to reach Greenland. The landscape remained snow covered throughout but different snow coverings and geographical features maintained the variety and interest throughout. Light and reflection were used very well especially with the lower angle of the sun creating convincing effects across the surface of both land and seascapes. The wilderness continued as travelled south in Greenland. Again wide flat areas of snow were modelled in such a way as to make them appear convincing whilst containing visual references that assisted navigation. Looking across the Greenland scenery higher ground loomed in the distance and produced a really atmospheric view of mountains. The Greenland continued to impress and kept the contrast between land and water. 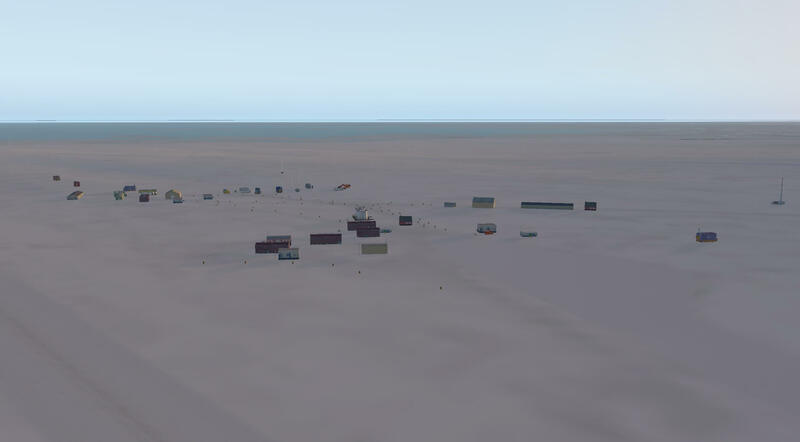 I overflew Qaanaaq and headed across the final stretch towards Thule. 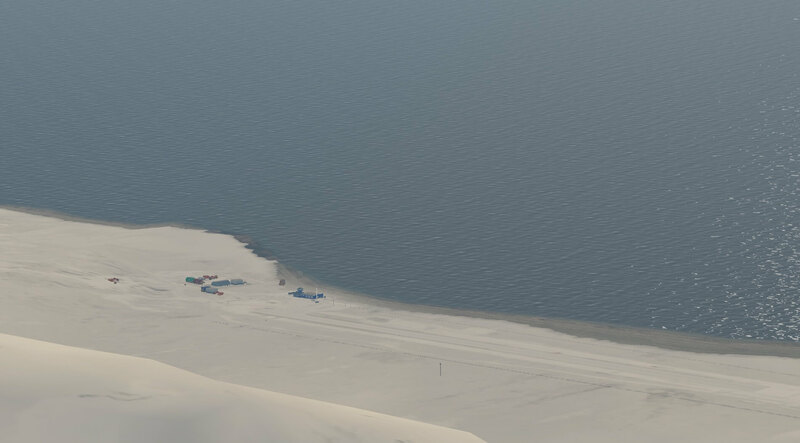 Qaanaaq was not easy to spot from altitude as it was modelled in snow and this is something worth considering when searching for venues in flight. The landscape remained barren and snowy during the final leg but continued to produce interesting features, convincing lighting effects and places of reference. Thule appeared on the horizon and fitted in very well with the surrounding scenery. Final approach again gave a different view of this large military airbase and showed the attention to detail the developers have provided. When I stared this review I was concerned that I would have to find interesting things to say about large areas of white, snow covered ground and large areas of water. 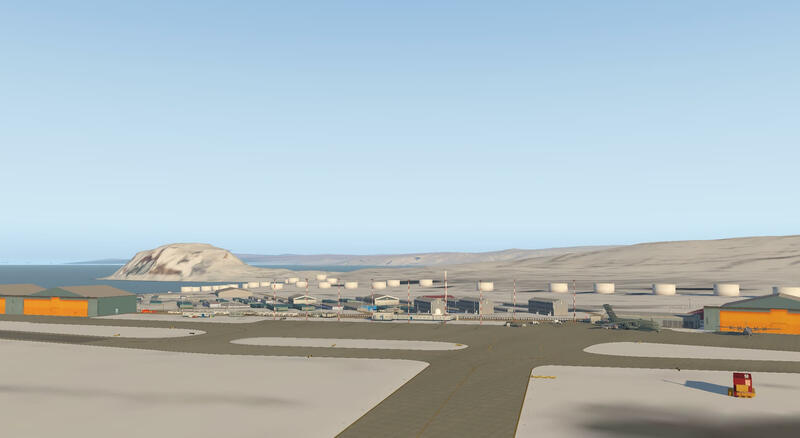 This is not the case with this scenery as the landscape and airfields provided are varied and detailed. Whilst the developers did say they had modelled for flight and there would not be a large amount of detail beyond that I found the equipment, building lighting and other detail provided was impressive. It is not as refined and detailed at the airfields as when buying a pay ware single airport but considering the scale of this scenery it is very impressive. There is a real challenge for developers of scenery in that they cannot use some of the triggers that enable us to enjoy the landscape such as sound and smell and rely on visual signs to help us appreciate what they are creating. 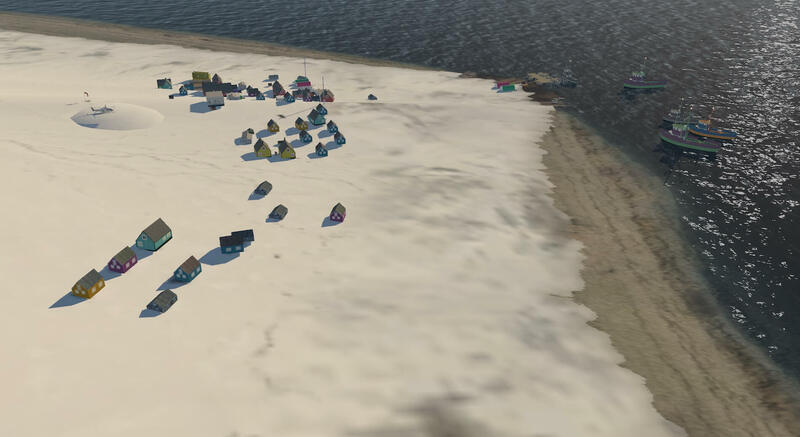 The developers have been clever in this scenery package as they have presented different locations with circumstances which represent different seasons. This has the effect of creating contrast between the areas modelled and emphasising the differences between them making things such as snow and ice more effective when compared to areas of vegetation and producing feelings of cold and warmth. The variety of modelling of the bases provided sets each site apart but with the inevitable similarities, emphasising the comparative activity and isolation of the sites. Some isolated and barren places that could have been modelled in a bland fashion, as there are not many people who have actually experienced some of these places but everywhere I visited and flew the detail remained varied, interesting and convincing. This is a great scenery package for experiencing the challenges of arctic activities and flight navigation between the various modelled locations is not always easy, especially as ICAO codes are not recognised in flight planning systems, but therefore presents an interesting challenge in itself and all from the comfort of our own location and not in the severe temperatures the real venues provide. 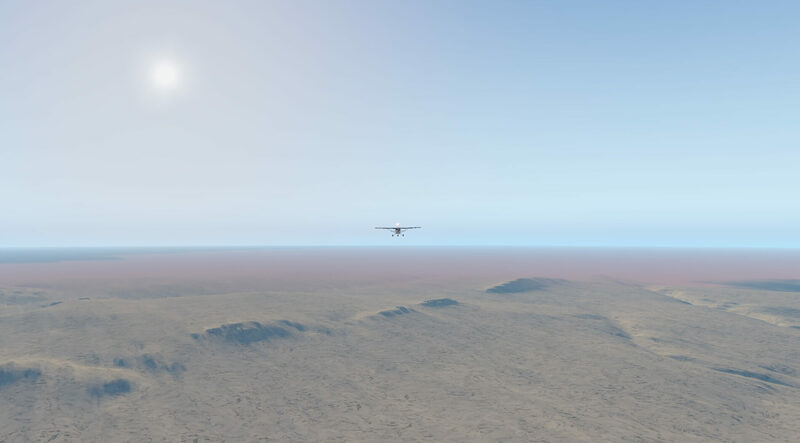 This package goes beyond simply modelling a few landing strips in a vast white wilderness and adds great opportunities for flight in these regions. The attention to detail remains impressive within the parameters set by the developers especially when considering the size of the area modelled. 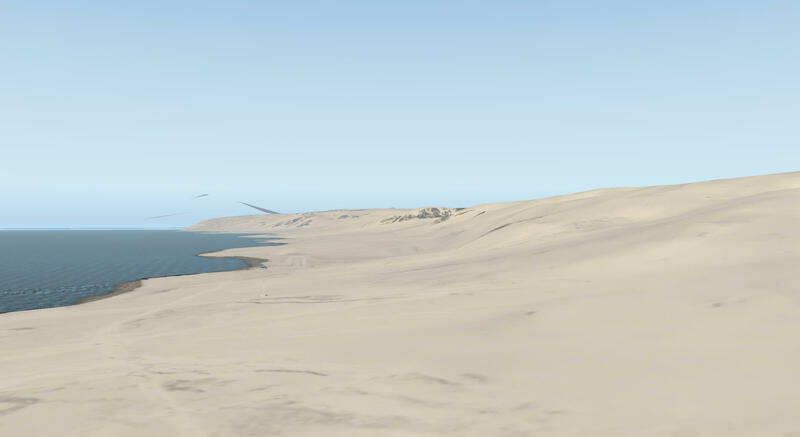 More information can be found at the dedicated X-Plane.Org product page. As of this writing and as Andy mentioned, the review is based on version 3.0, released on May 4th 2018 and cost you 39.00 USD. Hardware specifications: - iMac Intel i5 27"